Riders from more than 50 countries have already found their dream horses via German Horse Center. So we can most probably provide you with reference clients from your own country who will be happy to provide information about their experience with German Horse Center. We look forward to hearing from you! We would like to thank our clients for their trust in us and are delighted with the kind feedback we have received about German Horse Center’s service. Please find here results of some sport horses whose sale was arranged by German Horse Center. Sarah with Frodo placed 1st in both jumping classes, the BSJA Senior 80 and they won their first dressage competion the week before too. Congratulations! "I fell in love with Frodo 5 year old Akhal Teke the day I seen him advertised by the German Horse Center. I wanted something small fun and full of character that is definitely him. Hoping to do some eventing this season & have lots of fun we have already won classes in dressage & show jumping. The GHC was a pleasure to deal with in all ways, Really easy planning the trip over to view him to getting full vetting with x-rays & first class shipping all the way to the uk. Thank you to Stefan & Julia. If I'm ever looking for a new horse to join the team I will definitely call GHC." We wish a lot of success and many ribbions also in future. 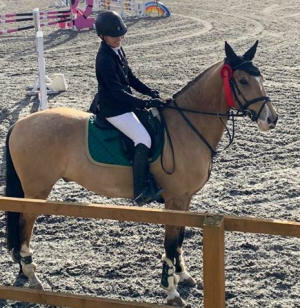 "Our 13-year-old daughter is extremely happy with this mare - which is only seven years old, very well-behaved and has already achieved scores as high as 7.8 - they are progressing together from one success to another! The tour was excellently organized, it gave us a wonderful opportunity to see and try out so many horses. Our new mare has great potential and we will ensure her training continues. Thank you, Stefan Kreutz, for finding this horse. We would also like to express our very special thanks to the partner training yard of Philipp Baumgart. They supported us with superb intuition as well as expertise in selecting this horse. Furthermore, we very much appreciated the outstanding service provided by German Horse Center." Congratulations to the great success! "Second show for Quando and I last sunday. We came 2nd out of 45 riders...one stupid mistake (by me,) in a medium trot cost us first place...but I am soooooo happy." "I went on a horse shopping trip in Germany in November 2017, looking for a young hunter prospect. I found the German Horse Center website and saw many quality horses of interest to me. When I reached out to the Center, I was contacted by Stefan. He was amazing, from start to finish. He lined up all of the horses for me to see and made a detailed itinerary for the short trip I had planned - I only had a couple of days. I even had to change my itinerary and he happily rescheduled the appointments. Every location I went to was beautiful. The horse sellers were all kind and easy to communicate with. Trying the horses was organized and punctual. When I found the horse I ultimately purchased, a 4 year old Holsteiner, Stefan handled all of my needs in the most professional and prompt way. All X-rays and vet checks were handled in an expeditious way. Once I was back in the states, Stefan sent me all videos I requested and the seller made videos especially for me that I requested. The export and flying of the horse to California was seamless. My horse, now named "First Look", arrived in late December 2017. Since then, I have shown him at 5 major California A-rated shows with Nick Haness riding. He has been Champion 3 times in the Young Hunters and Reserve Champion twice (in his first two shows). He is showing with a junior next week. He is an amazing horse and I am so very happy with my purchase and the experience I had with German Horse Center. Thank you Stefan for everything!" 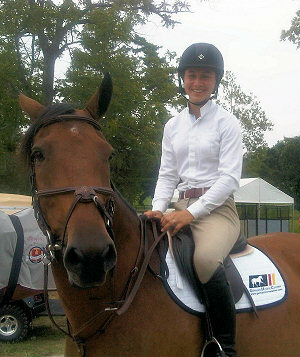 Alexandra with Chwupdiewup, they are already competing in the Children Grand Prix Class. Photo: PSV PHOTO. I know nothing about horses, so when the involvement of my daughter with this sport start to be more serious, I have this initial problem of "what to do?" "Which horse I need to buy? ", "Where I find that horses", "What prices have this horses?”, "is she have the skills to be a good rider or better she do not have to much expectations? ", to this questions I can add a few more. After a long search on internet and after talking with lots of people about where to search for the answers, I found GHC website and since then everything was much more easy. GHC answered to all my initial questions, showed me ways, put me in touch with a very good trainer (or as my daughter say "Marten is the best…but the best"), and since then everything was much more smooth and easy because he helped us on the search of the horses she need. Marten is a vey special person and a very good trainer. As a person he is kind, very polite and with a very special touch for young people. As a trainer is everything I could dream for my daughter, what she improve since she start to work with Marten, the different situations she have experienced with Marten, the show jumpings where Marten goes with Alexandra makes her improve the skills and, as a result, she is now a much better rider and much more consistent on the results she is achieving. Marten also help us on the search for horse that suits more to Alexandra, first he saw how Alexandra ride and what horses was more suitable and, after, we spend three days travelling and testing different horses, until we choose the one we want. Now Alexandra is completely happy with the new mare, jumping higher, getting better classifications and improving the riding skills. As a conclusion Marten was vital for the answer to all my questions, ad each time I have a new question he is the first person I talk, Marten was also vital for my daughter is now riding in a higher level and with lots of hope in the future. (Marten is the best…but the best). Alexandra are riding Chwupdiewup since five months ago and understanding between both are now much better. 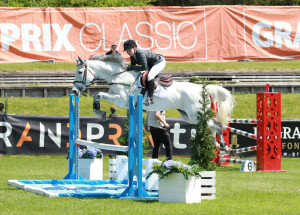 There is a before Chwupdiewup, where Alexandra is jumping maximum 1.15 m and a after Chwupdiewup where Alexandra is now jumping the Grand Prix for children at 1.30 m. On the last weeks Alexandra and Chwupdiewup are improving a lot and for sure by the end of June both will be ready for more challenging show jumpings." Allison with her mare Nora. They are already successful in the USA. Congratulations and all the best for the future! "We came across the German Horse Center while looking for a young horse to import for the Hunter discipline, and had a great experience start to finish. Due to time constraints and the cost of traveling to Europe, we chose to purchase Nora via videos and phone conversations. The GHC and their partner were fabulous to work with. Our American agent happened to already know the GHC partner so we felt very comfortable with their representation of Nora. They sent us multiple videos, photos, called me on the phone several times and worked very closely with us during the vetting and importing process. Nora arrived to us in Richmond, VA USA and was everything the GHC represented to us. She was purchased to be an Adult/Amateur Hunter horse and is very amateur friendly. Her ground manners are flawless, her conformation is good, and she has a very willing attitude to do her job. She is very brave to the fences, automatic lead changes, very comfortable to ride and is only getting better and better. The professional that helps train her has also really enjoyed riding her. I am able to take lessons and ride her outside of the ring as well. Overall she is a good quality horse and is learning her job very quickly. We have taken her to several horse shows and she continues to improve every time she steps in the ring. She is also a very pretty mover and has placed very high in her flat classes as well received ribbons jumping. The GHC staff, including Stefan and his team, was very responsive over email to make sure they understood what type of horse we were looking for. The vet called me several times during the vetting to make sure we were getting the information and x-rays we needed to make a purchase decision. Overall, we have been very happy with the GHC and would recommend them to others who are looking to import a horse." Successful in the Netherlands: Hyke and Camaxima. We wish you all the best! "Thanks GHC for finding my dream horse. I am really very happy with Camaxima and could not have wished for a better horse, because everything is right with her. She is with me now for only three months and we are already jumping at 1.30 level with some good results. She is very cooperative and jumps amazing! Finding a horse that suits you is quite difficult, but the GHC team has been doing its best to make this happen right from the start. The GHC tour was very nice. I have tried several nice horses and everything was arranged very professionally. I will definitely recommend a horse tour from GHC. You will not be disappointed." Rose in the hunter ring. We wish Sigourney and Rose many ribbons. 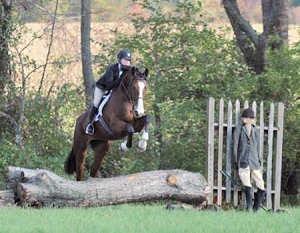 "Rose is doing wonderful and competing at the A circuit in the 6 yr old young hunter’s. She’s such a sweet horse and we are having so much fun with her. I couldn’t be happier! Thanks!!" Laurie immediately successful with Gustav in the USA. Congratulations! "Thank you GHC for helping me find my amazing new horse. Although my top 3 picks had been sold by the time I arrived, Stefan, with his numerous contacts, was able to arrange new prospects for me to try that weren't even listed on the website. I truly believe things happen for a reason and the first horse I sat on ended up being my favorite. Needless to say, Gustav arrived to my home in South Florida just a couple weeks later and I could not be happier. He adjusted quickly and I started showing him at WEF almost immediately. With top placings in the 1.15 classes, we will be moving up to the 1.20 classes next week. His show record in Germany is crazy good up to 1.40 so we have lots of room to grow together. If you are looking for a top horse at a reasonable price than GHC is your best bet! Thank you GHC!" Ixchel's daugther with the high talented show jumper Siegrfried. We wish you all the best and many, many ribbons! “I cannot recommend the German Horse Center enough! When my family and I set out to find the perfect Junior Jumper for my 13 year-old daughter, we were told to go to Holland as our barn usually does. However, we wanted to try something new and we found the German Horse Center online. From the start, their staff was incredibly helpful, very focused on appropriate fit for the rider, and answered all inquiries truthfully and accurately. We booked the guided service and they provided us with a very detailed tour itinerary and even had our rental car and hotel reservations taken care of. They drove us to stables that offered exceptional horses at VERY appropriate prices and they even filmed for us so that we could focus on the horses. After watching our rider, some of the partners offered others to try that weren’t in the GHC catalog, so don’t think you are necessarily limited to what is noted online. Historically, when I have tried horses, there has been a clear top pick. Not the case here. We were literally stuck between 4 horses of the 18 we tried over our 2 days (all 18 were amazing, by the way). Once we finally made our selection, all arrangements from having him vetted to getting him delivered to our barn in California were EXPERTLY handled by all involved. Yesterday, our boy arrived in perfect condition, happy as can be! We look forward to his sport career and look forward to visiting the GHC for our next horse. "I am so thankful for giving me the opportunity to buy my dream horse. Your professionalism is outstanding and it was a true pleasure doing business with you. Ps. 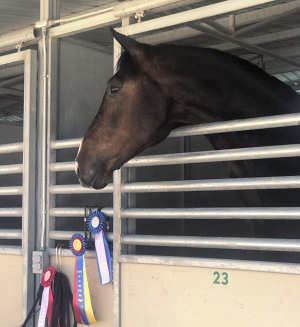 We already collected two ribbons:) "
Clooney is already very successful in the US hunter and equitation ring. Congratulations! 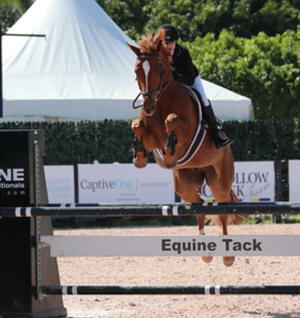 "I am so grateful to The German Horse Center for selling me my absolute dream horse! Clooney arrived this past June and he is just spectacular. We did several clinics and horse shows over the Summer and he is always in the ribbons in both the hunter and equitation ring. 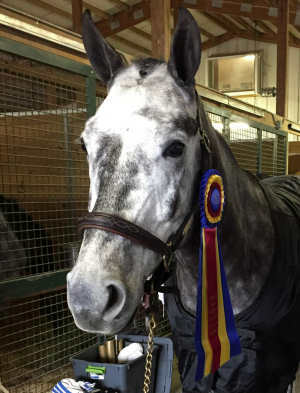 He earned several blues, as well as Champion and Reserve throughout the show season. The German Horse Center was a delight to work with-from shopping off video, to vetting and shipping-every step was easy and enjoyable. Clooney arrived exactly as described-sound, handsome, kind, patient, athletic and most importantly, a confidence giver. He has taught me so much in the few short months I’ve owned him. I look forward to a lifetime of success and companionship with this horse. I can’t say enough good about my positive experience with The German Horse Center. I highly recommend using them for your next horse purchase. You won’t be disappointed. Cynthia Lewis - Clooney - purchased June 2017"
"Easy Turn is now in quarantine on her way back to Australia. Easy Turn has come along wonderfully well in the short time we've had her. I'm very excited about her future. She had 2 starts at BE 100 with great results. Thanks for putting us together and hopefully we can find some more nice horses like her. " "Both horses are doing well and we are very happy with them. German Horse Center was incredibly helpful every step of the way. I highly recommend them. Daniel Ramseier (the dealer) was great to work with as well." Warmest congratulations to the successes of Cassandra's riders. "Attached are the most wonderful GHC horses. They are doing so well for their owners, couldn't have asked for better horses! Jane was with Guido immediately successful on her very first championship! GHC congrats on the very good result. "Hello ! I wanted to update you on my beautiful Hanseat ... a crowd favorite ?. Hanseat rode his first PSG/ I1 test and scored a 70.2 . He also received high point for the day." 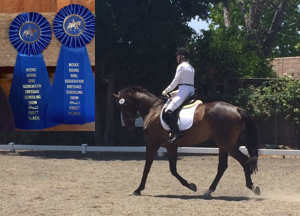 "Yesterday San Diego (Juno) competed at his first dressage event here in Santa Barbara. He won both his test level 1&2 classes and was the overall winner amongst the horses ridden by professional riders. We are very proud of him!" “I recently purchased my future partner in the dressage arena through German Horse Center…and honestly I just could not be happier. I opted for the full service and was accompanied by a very knowledgeable and super nice team member who drove me around to the different venues, translated for me when needed, filmed me trying the horses and kept the schedule running smoothly. I was very touched by the warm welcome, quality of service and felt so comfortable. The whole process went so smoothly from trying him out twice, to the vet check, to the purchase and finally to the transport to Switzerland. Within 10 days of having first tried him, Quando Hit travelled to his new home in Switzerland, to the beautiful area by the Leman lake. He’s settled in so well and has charmed all his stable mates! We have a gorgeous future ahead of us and I am so grateful. The whole GHC team wishes Jane and Gentleman just the very best! "I purchased gentleman from you approximately a month ago and just wanted to thank you for this amazing horse. In the past two years I had purchased two horses in the States and they were both unmitigated disasters. What I was looking for in the US was out of my price range so for my third attempt I decided to purchase overseas and found "Manny" on your website. I purchased him off video because I couldn't afford a trip to Germany and hoped for the best. When Carl from quarantine called to tell me he had arrived and described him as a "lovely bugger" and "cool as a cucumber," I felt a lot better. After picking him up and before riding him, I was elated. He's calm, beautiful and incredibly sweet. Everybody in my barn went crazy over him and my trainer told me two people wanted to buy him within the first week of his arrival. Manny is amazing under saddle. He's incredibly honest and straightforward. He loves jumping and is always determined to get to the other side. His long stride and rhythmic canter instill confidence and make jumping easy. He is definitely green and we're working on his flatwork but he's a quick learner and has made incredible progress. Most importantly, he's very forgiving and doesn't hold it against me when I make mistakes. I started riding again two years ago during chemotherapy after a twenty-five year hiatus. 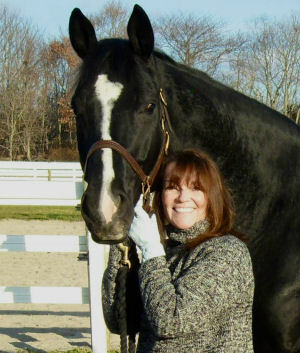 My cancer prognosis was very grim and I wanted to be around horses again before I died. Most days I was so weak from my treatments that the barn had to tack up the lesson horse for me and I would walk around the arena a few times and get off. But I feel like that small interaction with horses were key to my surviving chemotherapy and surgery and I've been cancer-free ever since. 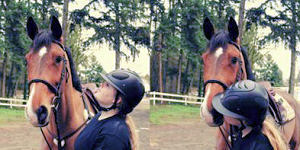 Manny is my reward for all my heartache and determination to not give up ... both in riding and in life. Thank you, thank you, thank you to Manny's owners and trainers. He's obviously been loved and well cared for. And thank you to German Horse Center for making it so easy to find and purchase this wonderful horse." "Two additional Things I want to add regarding Gentleman. Number one, when my vet examined him upon his arrival, he was extremely pleased with his condition. He said he's seen a lot of horses arrive from Europe in poor condition ... underweight, teeth need floating, etc. Not the case with Gentleman. Secondly, Gentleman completed his first show this weekend in the States and won three firsts and one third. I am so proud of him and excited for our future together. Thanks again for helping me find this amazing horse." 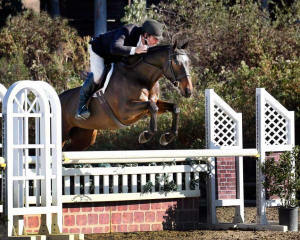 Ponticello has had a successfull career start on his very first show in USA. He is one of the three horses. 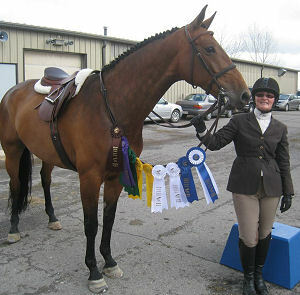 "Ponticello, reserve champion and a class winner at his first horse show! Lord Armitage, a high performance hunter. We couldn't be happier with the three horses you have sent us! Im sure I will be back for a new request soon!" Denise with Lizzy, a dream team. "Stefan (and all the German Horse Center partners), As I look at this picture I'm reminded again of the wonderful experience we had purchasing Lizzy. While it has only been a few months, rider and coach continue to be amazed by her athleticism and intelligence. We fell in love with her in Germany and love her more everyday. What a gift she has been already! Thank you all for assisting us with the process, providing us access to such wonderful horses, and partnering with us throughout the purchase process. You made something that initially felt like the impossible become a reality! Denise (and Grace) Slaff "
"I am the owner of Lady Rhapsodie, and I am just writing to you to tell something about Lady Rhapsodie. She is doing really well, and the news is that we were at a competition of young horses on the half of March. Lady Rhapsodie and I came the first in the competition with 70.18 %. I was very happy and proud of her. She learns fast and I am happy to ride her. In April we will go to another competition in the same level, so I hope that she will be that clever as she was at her first competition with me". The talented dressage horse Friedrich der Große. 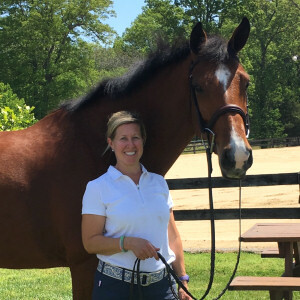 "I had been looking for a well-trained, well-behaved and large-framed dressage gelding for quite some time when I - rather coincidentally - came across the GHC website. There, a six-year-old chestnut gelding which was presented very appealingly with pictures and a short video caught my immediate attention. GHC organized a meeting with the owner within a few days, and only a week later we already picked Friedrich up. The organization by GHC was very fast and uncomplicated. The pretty gelding is talented and pleasant to ride, has a great character and has, as yet, been nothing but a real pleasure. I would contact GHC again anytime; they present an excellent selection of horses in a very appealing and informative manner." Trainer Alexa and her client purchased Cino (Cessino) by video. The horse show debut will be soon. Good luck! "I am happy to share that we are loving our most recent import from the German Horse Center named Cessino. We call him "Cino" for short now! I have just recently returned from spending several weeks showing at a circuit in Florida. Unfortunately, Cino was imported just before I was scheduled to leave. I was able to spend just over a week with him before I left and I was so impressed with the geldings kind and willing manner. It is so refreshing to be working with a horse that I can tell had a lovely start and foundation. Upon returning a few days ago, I was thrilled to come back and see a relaxed young horse trotting around the arena with his new teenage owner already expressing a great bond with him. He got a glowing report during my absence. This is all not possible without the German Horse Center's dedication to producing and presenting quality horses. This is our second horse from your organization and I am once again looking forward to the future success! We plan to have him make his horse show debut at the end of this month. I will be sure to check back with the report! Thank you again for your company's professionalism and honesty! Once again I feel as though I have received a horse that has exceeded my expectations. I have another scheduled to be here this week and can't wait to meet him as well! Cheers to future business!" 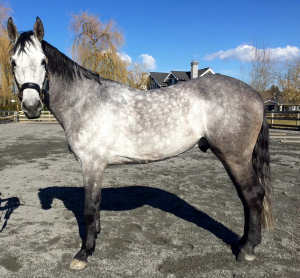 Guido is going to start his hunter career in Southlands, Vancouver. GHC wishes good luck and many ribbons. "Guido has settled in well and has captured the hearts of everyone in Southlands. He is so kind and willing - real gentle giant. Southlands is not the easiest place for a young horse because we walk on roads to and from the club, so the horses have to deal with traffic, construction, dogs, umbrellas, wildlife flying in and out of ditches, and so on. Guido has handled it all like a real star. While he has baby moments they are always a result of high spirits or momentary fright, which he quickly overcomes, and they are few and far between. Guido and I are enjoying learning together in our new partnership under the direction of our trainer Robyn Hunt and have an exciting first year of shows starting in late April. He is an amazing boy to jump - very brave and always trying his best to understand. With his lovely gaits and cadence, we are certain he will be a natural for the hunter ring. We will keep you posted on our progress. I attach a recent picture of Guido taken at his stable. As you can see, he is fit and well and happy. Thank you so much to Jens and German Horse Centre for helping me find my new partner. I could not be happier." Socke (formerly Santano) lives now in Utah. He will be trained for an eventing career. 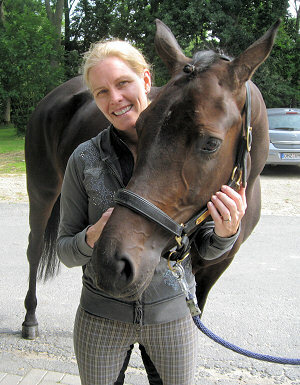 German Horse Center wishes Jenn and Socke all the best. "I had a terrific experience with Stefan and the German Horse Center! They were extremely professional and easy to work with. Their horses are incredible! Stefan scheduled all of my appointments, and I came home as the proud new owner of Mr. Socke! All of the facilities were top notch, and all of the horses that I saw exceeded my expectations. The trainers and horses were all very talented and well trained. I had high expectations for my visit, and Stefan certainly met and exceeded them all. The import process was simple, and Stefan had all of the connections needed to ensure confidence and a smooth transition for Socke. I’ve now had Socke for a month, and he’s been such a joy. He’s so talented, and I can’t wait to begin showing him this spring. I give Stefan and the people at the German Horse Center my gratitude and my highest recommendation for anyone looking to purchase a world class horse. "I am very happy with GHC, you found me a wonderfull horse, it's a plaisir everyday to ride him, and I'm going to touch my dream... doing Grand Prix in competition. Thanks for all." Cooper lives now in Maryland USA. At his first rated horse show he was champion in the baby greens. Congratulations! Thank you both for finding my wonderful horse, Cooper. He's been with us for about four months and is an absolute joy. It was so important to me to find a young prospect who would make up into an amateur friendly horse- not only to ride, but also kind on the ground. Cooper is everything we could have hoped for and more! Everyone at my barn loves Cooper because he is so kind and social. Since his arrival, we took Cooper on several field trips to get used to the trailer and horse shows. Stefan assured me Cooper was straightforward to handle, and he's been exactly that- remarkably well behaved for a young horse. At his first schooling show he went right in the ring and jumped around, and today at his first rated horse show he was champion in the baby greens, winning a class over fences and the hack. We are so thankful that he has such a great mind and laid back disposition! Our experience with the German Horse Center was top notch. From evaluating which horse to purchase, to vetting and shipping, the whole process was very smooth. Stefan was wonderful about answering my questions, sending additional video, and always responding promptly. The experience was so positive that a second person from my barn purchased a young prospect through you a month after we got Cooper. I wouldn't hesitate to recommend you in the future! Thanks again for working with us to find such a special horse." "I would like to thank you for arranging our trip to Germany looking for a new horse for my daughter. Every aspect of the trip was very well organised from the moment we picked up the rental car at the airport until we returned it on the way home.Most importantly though, all the Partners we visited were very welcoming and helpful. Each of them listened carefully to what we were looking for before suggesting two or three horses for my daughter to try. We were impressed with all of the horses and our only complaint was that it made it very hard to decide between them! 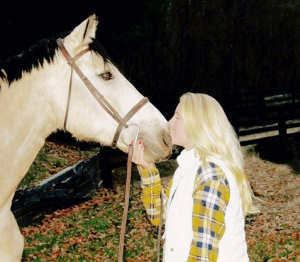 With help though from Franz, our Independent Advisor, we were able to decide on the perfect horse for our daughter and returned home very happy." The 12 years old daugther Lauren with the 6 years old Santinos. Immeditately successful in the USA. Congratulations. "Hello! Thanks for following up on how Santinos is doing. In one word…..WONDERFUL!! We absolutely love this horse. My daughter, Lauren, who is 12 years old has been riding him almost every day. He is a kind horse with a great brain. Lauren and Santinos have already bonded and become a great team. He has been to one horse show where he performed very well. He was calm and well behaved. 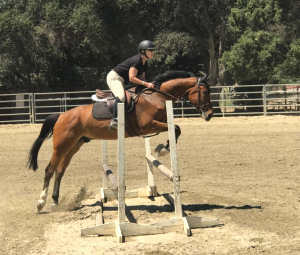 He is very willing to jump and is an amazing mover. We can’t thank you enough for helping us to get this horse. Everyone at German Horse Center was great to communicate with. His transport was smooth and easy. We would definitely recommend others to use your facility. Thanks again for such a wonderful horse and purchase experience." Casino Cèsar by Casino Berlin, a promising prospect. Via a sales advertisement on your portal you introduced us to the well-renowned stud and competition yard of Gerd Sosath. Mr Gerd Sosath and his daughter Janne gave us some very good advice and went to great lengths to help us find the kind of horse we were looking for. This is how we found our dream gelding. So now we would like to take this opportunity of saying, once again, a very big thank you to Ms Tanja Uredat and Mr Stefan Kreutz. Best regards, the Herget Family"
Lauren with Rio, formerly Foreolan. We wish you all the best for the show season 2017! "Our experience with the German Horse Center was excellent. The facilities we visited and the horses we saw were all top-notch...but as soon as I saw/rode Foreolan, AKA Rio, the search was over. From scheduling the multiple trial rides, to the vetting and the shipping, GHC was there to help me bring Rio home with me to Pennsylvania. Thank you, thank you, thank you for helping me find "my horse of a lifetime" We are really developing a great partnership, and I'm looking forward to the 2017 show season! I recommend the GHC, specially Stefan Kreutz, to EVERYONE, and if there is another horse in my future, I will definitely be using your services again." Happy with the training: Heidi with her horse Bizzi and trainer Dries van Peer. "I would very much like to thank you for the great weekend with Mr. van Peer. Everything went well and was perfectly organized - you chose an excellent trainer. It really couldn't have been better. We have not been making any progress for an eternity, and now after just one weekend... Dries was able to figure out my needs right away and had immediate answers to any issues I had. Suddenly riding became so logical and no longer complicated to me. And the best: it continues to work: same system, same results. There's still room for improvement but everything is much better. I almost thought I had a different horse! In any case I'm very pleased at how everything has turned out - it has really brought us forwards. Should we ever meet in person I would like to give you a big hug. 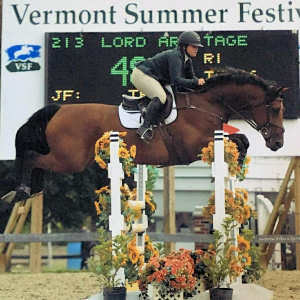 Kacy with Lord Armitage, successful in the US jumper ring, competing in National Hunter Derbies and Equitation classes. Congratulations! 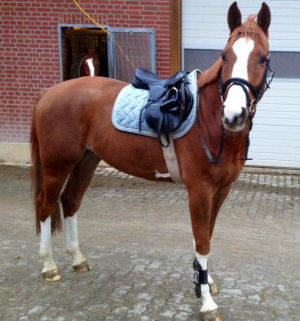 "I bought my horse Lord Armitage from German Horse Center and I couldn't be happier! He has helped me step back into the jumper ring and showing in 1.15 classes with room to go higher. Lord Armitage or otherwise known as "Sven" has also competed in National Hunter Derbies and Equitation classes as he can be the master of all trades. Sven is the ultimate confidence builder with the best personality and tries his hardest every time. German Horse Center does an awesome job and I will definitely be buying another horse from them in the future!!" Julie with Querida. First dressage shows are planned. GHC wishes good luck and many ribbons! "During my entire experience from my initial contact and telephone discussion with Stefan and the team at the German Horse Centre right through to the arrival of our lovely young mare in the UK every detail and concern was dealt with professionally and with sincerity. I travelled to Germany in February of this year and spent a wonderful weekend riding 8 well bred young dressage prospects. It was an absolute privilege to meet and ride at the home of some of the GHC breeder/partnerships. The horses were all well presented to me and their video performances on the website were extremely reliable. I eventually settled on a wonderful rising 4 year old Hanoverian mare who not only exudes talent but is just the sweetest and most. sociable horse we have ever met. She is quite simply a joy to have at home and has fitted into our small yard so well that we regularly have to remind ourselves of her young age. She loves her training but equally enjoys riding out or relaxing in the paddock. We plan to continue to build on our new partnership and begin competing this autumn. I would definitely recommend GHC to anyone looking for a quality horse and I can guarantee some wonderful 'horse tour' memories! Thank you again GHC for enabling me to find my dream horse!" Congratulations on this beautiful, talented young dressage mare, Zsófia! "Everything is fine with us, Lady Rhapsodie arrived safely and healthy. She is a wonderful and really kind horse! We had our first training under saddle today and everything went like when I tried her. Every day she is eating carrots after work. During the weekend we started to build our relationship and she moved a bit in circles. By the way I had a wonderful experience with GHC! I think this team that you have is professional. First of all I am really satisfied with the work, patience, kindness of Stefan. We had innumerable e-mails during the organization and he explained every detail exactly and understandable! I never had an experience with buying a horse abroad, so at the beginning I was too prudent, but after experiencing the perfect organization of GHC I was much more relaxed. I was surprised completely when Stefan sent me that horse tour document with every detail, because I never thought that your team will do everything in my place. I would like to thank you a lot that I have found my dream horse! She is beautiful and sweet! Now we are on the way to go up and up in dressage. " The 12 years old daugther of Cheree with the mare Aimee. A great team. "I would highly recommend the German Horse Center as a liaison for importing a horse from Germany. The GHC was extremely professional, punctual and ensured that the selection and import process was smooth and transparent. I love our new mare and look forward to the partnership she will form with my daughter." The 12 years old Valentyna with her mare Chicago RA at the Czech Republic Championship for children and juniors. She achieved a fantastic 6th place. Congratulations! "I just wanted to get in touch and let you know how things are going in Prague. We are doing well, and Chicago RA, the horse we found via GHC, is making excellent progress. My niece Valentyna loves her and they are very successful ! 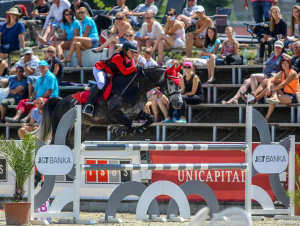 In June they qualified for the Championship of the Czech republic for children and juniors, qualification limit is 115cm and 120cm. The Championship took place in Olomouc here in the Czech republic now in July . Valentyna and Chicago rode 2 rounds clear and in the final they had 1 fault and they got 6th place! 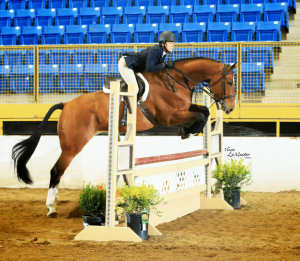 It is a great success because Valentyna is just 12 years old and it is her first season with big horses." Catgirl lives now in Texas, USA. 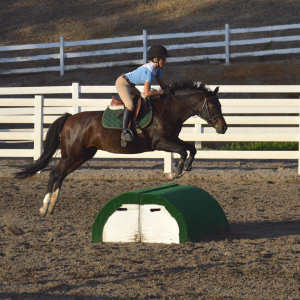 "I bought two horses from you guys ( Liberty Girl and Catgirl ) and I just wanted to let you know that that was such a smooth experience getting them over here and the horses are WONDERFUL! We love them so much. They are great. Liberty girl will be a wonderful hunter! She is stellar! And Catgirl is amazing as well she is quite the jumper. Again I just wanted to thank you!" The video shows Blanche with Catgirl. Thank you for the great video clip, this a perfect match! Valentyna, the niece of Miriam, with Chicago RA, the mare is already placed in 1.30 m classes. "Our experience with the German Horse Center was extremely satisfying. GHC made the whole process of finding the right horse for my 12 years old niece. We would like to thank, in particular, Stefan Kreutz, with whom we corresponded for a several weeks prior to our trip to Germany. Stefan always returned our emails promptly. Stefan made every arrangement, including hotel reservations, tour planning and making all our appointments at all the various partner stables. A few days before our trip Stefan sent us a detailed itinerary outlining the stables and listing the horses selected for my niece to ride. Our Horse Tour was wonderful, and in the end we found a new horse for my niece Valentyna. 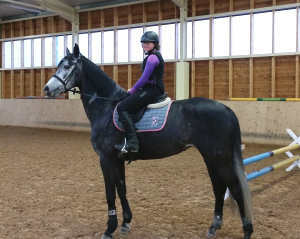 Her name is Chicago RA , she will be 7 years old and now they are training for upcoming show jumping season. We will definitely recommend GHC to everyone looking for great horses. Thank you for your help!" 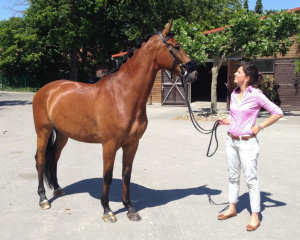 The talented dressage mare Like A Star is trained now in Switzerland. "Honesty, professionalism, adaptability, are the key words of this very serious company, which has really well understood my wishes to lead me to the perfect horse for me." Jasmine has found her dream horse for riding and carriage driving. 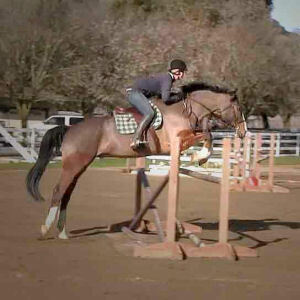 "I had been looking for a young horse for eventing and driving for quite a long time. It turned out to be more difficult than I had imagined to find such a horse. But then I came across the German Horse Center website. When I investigated a bit further, I discovered that a friend of mine had already found her dream horse via German Horse Center. She had only good words to say about it. And this is how I was able to quickly obtain the contact details for stables that were only two hours away from me by car. Once I had received a few photos of various horses I had a pretty good idea which of them I liked. And the choice became clear after performing free jumping and a test ride. It turned out to be the youngest of them all. And when I also found out that his name was St. Gallen (the same name as my home canton), fate had really taken its course. So now I have found my dream horse too - a horse suitable for all types of riding and driving. I was provided with great service by German Horse Center and by the Stall Schmid stables. I am therefore happy to recommend you all to others. Quite simply fantastic! Thank you for helping to fulfill my dream." "I am writing to inform you that Beatric S arrived to the UAE and I am so proud and more than happy to own such a great mare. Also I would really like to express my appreciation for your support through the process it was a reliable and trustful experience to buy unseen horse through the center." 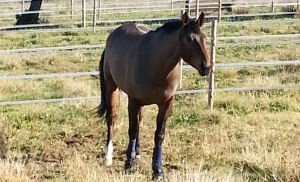 The young dressage mare Esmee lives now in Down Under. We wish you a lot of fun and many ribbons! "Just a very big "Thank You" from me!! I purchased this beautiful 5 year old mare ESMEE 8 late 2015. Esmee8 was a stand out. I live in Australia and made the decision to buy her through German Horse Center without catching a long flight from Australia to Germany. This decision had to be handled with full knowledge of what I was buying. German Horse Center were wonderful ...informative... Nothing was left to luck nor could it be. 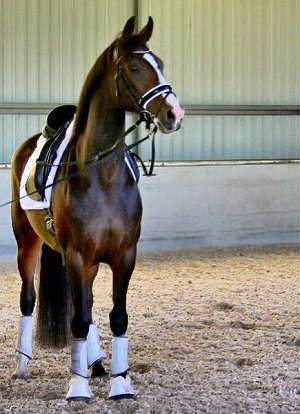 She is a beautiful and talented dressage mare. 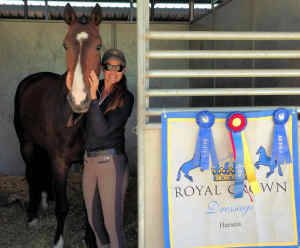 I could not be happier…"
Cherie with her two successful show jumpers. Discovered at the GHC partner stables. "Our trip to Germany to go horse shopping could not have gone more smoothly. The German Horse Center handled everything, our itinerary was set and we were off. Everyone spoke English which was very comforting. The partner stables were very professional. The quality of all the horses was top class and the facilities were excellent. Having completed our first show season, the horses we purchased through the German Horse Center were wonderfully successful. 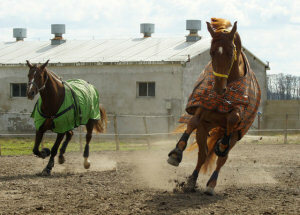 Since both horses are young we are excited for their competition future. Only the highest compliments for the German Horse Center. We have strongly recommended them to our friends and clients here in the United States." Arrived safely: Danah with her show jumping mare Alexia. "After months of searching for the right horse I had finally come across the GHC website where everything was so clearly written in detail of every single horse. I saw a beautiful mare named Alexia who seemed just right and was exactly what I was looking for. The GHC were very quick and prompt to answer all my questions and reassured me that I had finally found the right horse for me. She's finally home and I honestly look forward to being with her everyday. She is exactly what they said on the website, a true confidence giver. Extremely well-schooled and such a kind and loving mare. I am honestly extremely blessed to have her. Thanks to the GHC for making dreams come true!" Victoria with her wonderful pony Angel Eyes. "Unable to fly from America to Germany to try horses, GHC made the experience of buying my pony very easy. My trainer Cassandra Keith has already flown in two other wonderful horses from Germany with no problems thank to Stephan and Tanja. Looking at my wonderful pony Angel Eyes, both my trainer and I can see her potential of Pony Finals here in America. 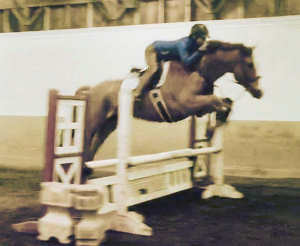 Before we bought Angel Eyes I was only able to do trot cross rails. Now, in only a few months, Angel Eyes has taken me up to 2'9 in hunter ring. She was categorized as a confidence giver, and that is most definitely what we got. Not minding many of my riding mistakes she has corrected, taught, and cared for me. We went to our first show in June and did very well, ending the show with first place ribbons and a champion in our division. We have gone to one other show since then, and couldn't have been happier with the results. Our journey is just beginning and I have much more to learn, but this pony has been a blessing in my life. Thank you GHC!" "We are so happy with Coline and had a great trip with German Horse Center last time, we look forward to coming back next month. 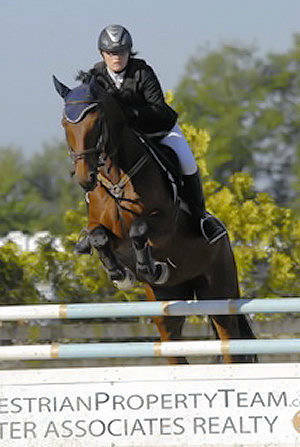 Thank you, Juliet and Sarah"
The video shows the mare Coline, purchased via GHC, in the $25.000 Grand Prix of Princeton. Congratulations to Juilet and Sarah! Mary found her superstar via GHC. 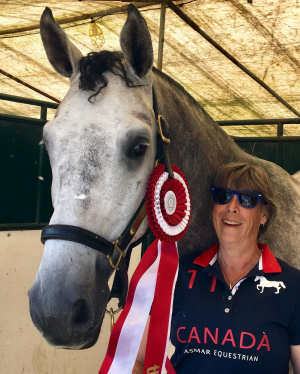 She won with her mare Cosmic Dream the Junior Rider Award in Spruce Meadows, Canada. Congratulations! 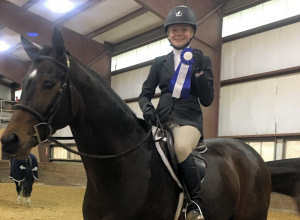 "Mary won two Champions at Spruce and as a result Mary won the Junior Rider Award. The junior rider award is given to one Spruce Meadows competitor under the age of 18 who exemplifies sportsmanship along with top results across all divisions. It is a very big honour as Spruce Meadows attracts riders from all over the world. 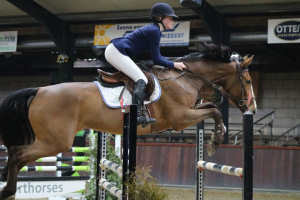 Mary competed both 1.20m and 1.30m and won two champions." 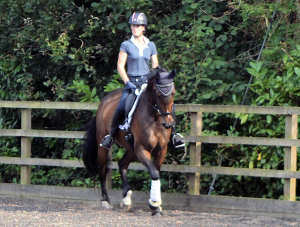 Maike with her high talented dressage horse Flint. 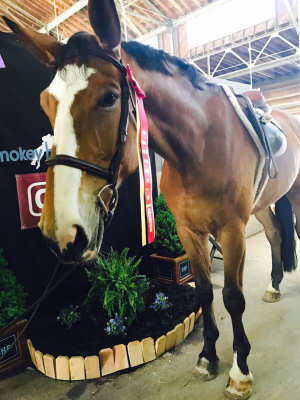 "When looking for a talented, properly trained and above all supple young dressage horse, we quickly reached our limits while searching ourselves. After a number of viewings we were almost ready to give up, but then by chance we discovered the German Horse Center website. It was quite a pleasant surprise; I took a look through the horses on offer and then immediately contacted Mr. Kreutz. Everything was very professional right from day one. We were sent a tour that had been planned in order to allow us to visit all the horses that were of interest to us. The pictures and videos on the website were very realistic. The stables were all very nice and orderly. The proposed horses were well ridden, not kept in cramped conditions, and gently trained in line with their age. That is no longer very often the case, unfortunately. It was difficult to choose between the fantastic horses. We finally found our dream horse during our second tour. Five-year old Flint has now been with us for a few days. We are very happy with him. He is sweet, well-bred, and quite a clown. He has great potential and we will make sure that we continue to train him gently. We are very happy to recommend German Horse Center and will most definitely be using the service next time we are looking for a horse. It quite simply worked perfectly, without any 'ifs and buts'." 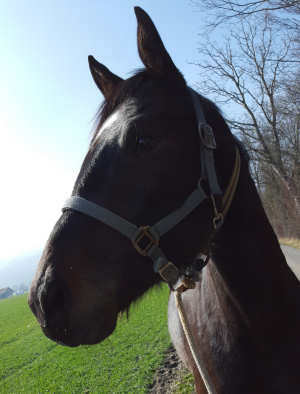 "The dark brown Oldenburg mare caught my eye on the German Horse Center website. I also quickly received the contact details of the Kathmann dressage horse stables in Vechta from German Horse Center, which is where the mare called "It's Pretty" was kept ? I already thought the mare was fascinating because of her name! We then quickly booked the trip to northern Germany. We were warmly welcomed at the Kathmann stables and Pretty was presented to us. After a first meeting, a test ride and plenty of stroking, we quickly realised that it wasn’t just Pretty’s name but also her lovely personality that impressed us and made her unique. After completing the purchase, we decided that the four-year old Pretty should first get a good basic education north of Munich with people we knew. 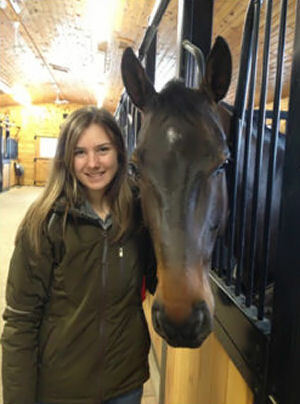 She spent almost three years there learning the basic skills and gained her first competitive experience, including a victory and some placings in dressage tests for young horses. She was also brought out competitively in the show jumping arena and enjoyed this discipline as well. This spring it was finally time for us to go and collect Pretty and bring her to Switzerland with us. I first spent two weeks with a friend and our two other horses in Munich. Pretty and I grew into a great team during that period. I could never have dreamed that I would compete with Pretty after less than a month together. But her sweet nature, the great training and her great trust made it possible. Many, many thanks to the breeder, the Kathmann dressage stables and the trainers. Pretty is wonderful!" Maggie with Cinderella (Coco Loco), they are very successful in the United States. Congratulations! "Cinderella is doing wonderful. The horses are back in New Jersey now and I just took her to her first horse show in New York last weekend - she placed in every class! She is so brave and so well broke - it's hard to believe she is only 5 years old this year. She really takes care of my mom, which is most important, and is so athletic with me - she really adjusts depending on who is riding her. My trainer, who is very well respected and top trainer in the hunter/jumper/equitation A circuit, loves Cinderella and is so delighted that we got her. 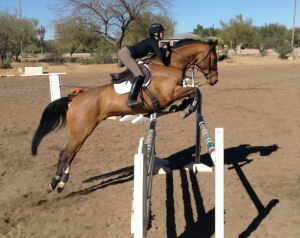 He is so very excited for her future and thinks she is a super jumper and mover. Our close family friend and professional Dressage rider based out of Wellington, Florida has seen Cinderella once in person and also in videos and she is in awe of her - she thinks Cinderella is a super quality mare for dressage too and wants to breed to her or if we ever need to sell her she wants to be first in line! Everyone loves the mare and is so complimentary of her athleticism and movement across the ground. I only have the best to say about my decision to buy Cinderella and the experience/process to do so!" Aleksandra won with her mare all major competitons last season. Congratulations! I don't know how to thank you for helping me to find such a good horse that has everything i need. Cassina is really a confidence giver and she opened the door to many major competitions for me. From season to season, she was better and do her best to respond to our demands. The results came in - last season we won all the major competitions and now we start another season together. She is really the best. Once again I want to thank you for the time and effort you have invested in us. I definitely recommend GHC to anyone who wants to quickly and safely find excellent horses for their needs." 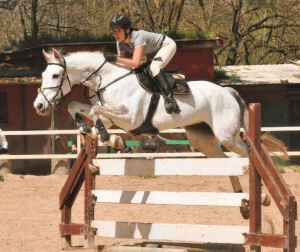 "When I started looking for a new horse I had a budget, some demands and a dream. I was sure I had to go abroad from Norway to find a youngster with talent within my budget. I started searching but I soon found out that looking for horses in Germany was not that easy without a contactperson. This is where German Horse Center came to my attention. I sent an email with my wishes and Stefan and the rest of GHC took care of everything. Close to tryouts I received a schedule. As I brought my vet with me I knew that it would be to tight and requested more time at each stable, we got a new schedule but even then we didn’t manage to keep up with it. I was introduced to many good horses. As I was very lucky to bring my vet with me I was able to check them straight away. I’m used to meet some resistance when I want the vetcheck to be done straight away but that was not the case for these stables. All the stables I visited took good care of me and tried their best to meet my wishes and requests even with a short warning ahead. When I selected my horse I got all the checkups that I requested from the vet. GHC also offered help to get the horse to Norway. What I really appreciated is that the service GHC offers me as a customer does not cost me anything. Not even if I can’t find a horse. That takes away pressure to find that special friend and the risk of making the wrong choice is a little smaller. Today Cinderella has lived with me for almost five months and I have so much fun with her. She is really the talented and kind horse I was looking for. Thinking back I didn't really think she would be anything but now I'm so pleased Stefan made me go try her. I would recommend GHC to all my friends. Thank you so much!" First show: Miranda and Carivero got a first place, and 2 second place ribbons. Congratulations! "My Mom and I flew to Germany in December. We had never been, and we were somewhat apprehensive as to what to expect. We needn't have worried, as Stefan and Tanja made every arrangement, including hotel reservations, tour planning and making all our appointments at all the various partner stables. They even went as far as offering ideas for side trips and sightseeing. Throughout the entire process, they were always only a phone call away to put our minds at ease. The German Horse Centre was phenomenal to work with and always answered our many questions in a timely manner. They took care of all the details, from arranging the vetting to organizing the export, making the whole experience enjoyable and stress free. Stefan and Tanja are honest and simply lovely, adding a personal touch to make the whole experience unforgettable. 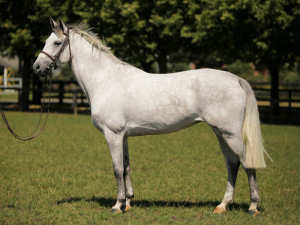 I would highly recommend the GHC to anyone looking to buy a horse from Germany. Thanks to the German Horse Centre I was able to find my dream mount Carivero"
Update one week later: "Just an update on Carivero, in our show we got a first place, and 2 second place ribbons! He’s doing amazing!" 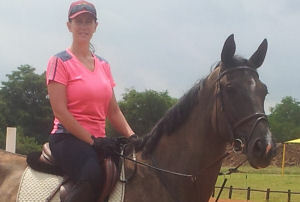 Louise with her dressage horse Dr Brandy. "It is now just over a month that Dr Brandy has been with us and I write to express my heart-felt gratitude for all your help in finding him. I still can't quite believe that he is such a perfect match for me. He has settled in very well and is now completely at home. We are now up to speed with the riding and he is happy and settled in his work. Plainly, he is a talented sport horse, but he also has such an excellent character. As you knew from Malcolm, I am not a hugely experienced rider but with this horse I am able to learn fast without annoying him. He is very forgiving and already we have a strong bond. In the stabling and in handling, he is both respectful and affectionate. His manners are excellent. I am also hugely grateful to Julia Wentscher for her diligent and efficient help and completely accurate advice. She told me this horse could be nervous in new situations but with patience that goes. This has been my experience and by taking our time, Dr Brandy is now completely relaxed in his new routines. I could not recommend your approach to buying horses more. Our Horse Tour was wonderful, with horses selected which were completely appropriate for me and all effortlessly arranged by you and Tanja. However, it is perhaps the clarity and honesty of the advice that I was given by you and Julia that I value most. That can be a commodity in short supply in the world of horse buying and it erodes trust and confidence. The professionalism and integrity of your organisation creates a climate of trust and as a result I now have a horse that dreams are made of. I am in your debt, And with very best wishes, Louise King"
Paradiso, Elizabeth Clark and trainer Cassandra Keith. "Our experience with the German Horse Center was extremely rewarding. They made the process of finding the right horse for my young student very easy. My clients were not able to fly oversees to try out horses, so we purchased Paradiso after viewing many videos. This was the first time we imported a horse and Stefan and Tanja made sure that everything went well. The team and their partners answered all our questions efficiently and, upon my request, provided additional video of Paradiso demonstrating his ability to perform various actions. The entire experience has been such a pleasure. Paradiso arrived in California about a month ago and has met all of our expectations. We want to thank Tanja, Stefan and Lutz for making it so easy to purchase such a great horse. I highly recommend the German Horse Center to anyone interested in importing a horse from Europe. It is a one stop shop that provides everything you need to purchase a high quality horse. Their team does all the work for you and you are guaranteed to have a positive experience with great results." Dana and Mach 5 just attempted their first A-level Grand Prix. "Just an update, I hope this email finds you happy and healthy. Dana and Mach 5 just attempted their first A-level Grand Prix at an indoor show in southern Ohio. They rode clean and got a second place! They are doing great together." Update in February: "By the way, Dana just won her first Grand Prix on Sunday. And just won the ‘welcome prix’ at the current horse show yesterday. Now she has two Grand Prix victories." The video shows Dana and Mach 5 (purchased via GHC) on their first A-level Grand Prix in southern Ohio. They got the 2nd place. Her father Bob made the video. Everybody was very excited. Congratulations to Dana and her family. Marie with Ariella: First show, 3rd place. "Ariella she is the number one in our family now. Both my mum Patricia Charles Creighton know without your help and event rider Julia Schmid we would never have found her. Every time I see her I laugh and smile a lot she has such a positive outlook on everything there's nothing she can't do in her life this energy she has, spreads to anyone why comes her way. Julia has done such wonderful work producing her I feel very thankful to Julia for letting me take the reins. I always take my time getting to know horses I think this is the best way to build up a long term trustful partnership so we are in Dressage training right now with my trainer Patricia Charles Creighton who is a European junior event rider on team GB showjumped to grand prix, Grand Prix Dressage / judge trained a lot of high standard horses and riders including myself I worked for the great Late Iris Kellet riding a lovely talented young horses, also my very talented and majestic uncle Peter Charles who win Gold for the team in GB in Showjumping. We will keep you updated with our progress thank you so much Stefan, the German Horse Center and Julia Schmid for all your help and support. Camellia is very successful with her show jumper Cupido in Singapore. "So unbelievably happy with him. 4 clear rounds this weekend. He got me through my first 1.20 and made it look easy, thanks buddy. Words cannot describe how lucky I am to have him." "I just wanted to get in touch and let you know how things are going in Singapore. We are doing well, and Cupido, the horse we found via GHC, is making excellent progress. Our daughter is very happy and is jumping from success to success!" "The service from your side and from Julia Wentscher from Kathmann KG was great and thank you for the nice attitude. We really like Braveheart it is nice to ride him (...) the horse’s behavior and mental state is very good although he is young. So we bought a really nice and attentive horse from Julia and we are satisfied with Braveheart and with Julia’s and GHC’s service! Thank you!" Two daugthers from Ines with the 1.30 m class placed dream mare Chacca Chacca. "We certainly didn't have an easy task for the GHC team. 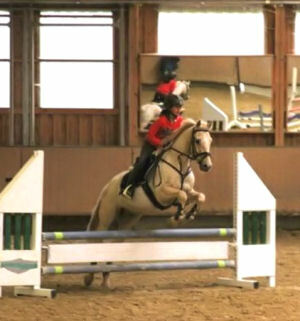 We were looking for a well-trained show jumper for our 10-year-old daughter. We wanted a horse with sufficient potential but one that was also very reliable and easy to handle, due to the young age of the intended rider. Despite these challenging requirements, Mr. Kreutz designed a perfectly organized tour for us that involved meeting and trying out ten horses. We were very warmly welcomed at all the partner stables and quickly found the perfect horse for us! Chacca Chacca is a very pretty 7-year-old mare. She has been highly placed in the medium class and has an absolutely wonderful personality. She is very reliable, and has a very even temperament and sweet nature. She is predictable, calm, cooperative and keen to learn, even in new situations. She also loves hacking out and is equally happy traveling in her horse box. Our daughter has complete faith in her when jumping. The two of them are already a great team and have fun together, and the progress they are making is very evident. With her uncomplicated and friendly nature, our four daughters have really fallen in love with her and she provides us with great enjoyment every day. We can hardly wait to compete with her for the first time. We would like to especially thank the GHC partner - the Jens Baackmann training stables. They demonstrated a high degree of sensitivity and, with the benefit of their considerable expertise, intuitively selected the right horse for us. We wish GHC the continued success that it so richly deserves and we are sure it will generate many more customers who are as satisfied as we are!" Cilkenny with Stacy's daughter Belle. 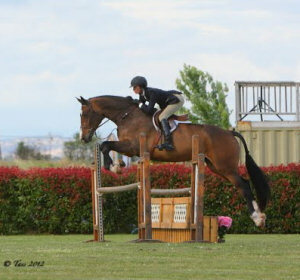 Cilkenny is a dressage and hunter prospect. He lives now in St. Louis, Missouri, USA. "Never did I think that we would ever purchase a horse from oversees! Never! The logistics alone seemed like something I just wouldn’t want to deal with. And, yet here we are. 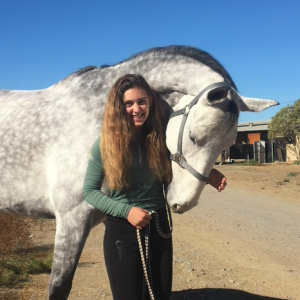 Not only did my daughter find this beautiful young horse on your website, but, we did our homework on him as well as your facility and here we our with our beautiful Cilkenny imported from Germany. I must thank everyone involved with this relationship…Tanja, Stefan and the shipper from New York who coordinated all of the hauling details so I had literally nothing to do but greet the carrier at our barn. At the beginning of our initial communication with the German Horse Center, I was unsure how the language barrier could play into effect and was pleasantly surprised that all communication was in English and was beautifully written as well as spoken when we were on the telephone. All in all, purchasing a horse from out of the country, while a daunting thought, was actually a seamless experience. The German Horse Center took care of everything from the videos, vetting and shipping. All we had to do was welcome our beautiful new horse into our family. Clara (Coreanna) enjoys now the pastures in Canada. "It’s been a month since Clara landed and I still can’t believe that we have her! She is the most amazing horse I have ever ridden and on top this mare is the kindest and sweetest pet. It is obvious that Clara was skillfully, carefully and lovingly bred, raised and trained. When she was presented to us by your partners I knew Clara was my dream horse and I was very happy she came from such a great barn. Exactly what I hoped for but did not expect to find so easily. I want to Thank You, Stefan and the team of German Horse Center for providing such excellent and professional service. You were incredibly easy, nice to deal with and every one of your partners showed hospitality and were very pleasant. This was our first time buying horses overseas and you made it a very successful and fun experience. We will definitely recommend GHC to anyone looking for great horses. Thank You, I will send pictures and updates of Clara and I"
Sharyl with Duplin at home at Willow Ridge Stables. "I am very happy to endorse the German Horse Center. The assistance I received in the purchase of Duplin was friendly and very professional. Stefan Kreutz was more than helpful and patient, with many, many phone calls made overseas with an eight hour time change. It seems daunting to attempt to choose a horse, make arrangements for a trial ride, arrange a pre-purchase vetting (of my choosing), then arrange an extremely complicated travel plan to Canada, and in the end receive a wonderful horse. Stefan and the German Horse Center achieved this and much more! I would also like to thank Kai Ligges for all his help with the purchase of Duplin. The partners of the German Horse Center make it possible to have access to many wonderful horses. Duplin is everything I could have wanted! 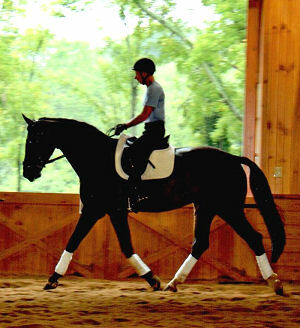 He is a confidence-giver, but a superb mover for dressage. He is beautiful, shiny black, with a loving nature that melts your heart. Thank you German Horse Center. I recommend anyone in Canada to contact you when shopping for a horse overseas. 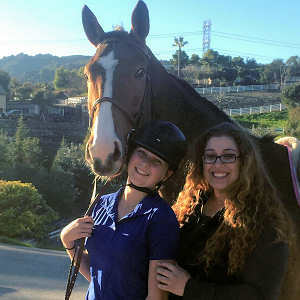 "After finding a suitable retirement place for our former four-legged companion, it was time to start looking around for a new, devoted equine friend. I looked through all the riding newspapers / advertisements / websites etc. However, the search proved difficult because both of us are tall, so we were looking for a suitably large horse. And no - it wasn't just any old horse we were looking for: we wanted a gelding (preferably not a gray) with dressage talent; the level of training was fairly unimportant although it had to be at least to preliminary/novice level and the horse needed to have a height (to the withers) of at least 1.80 m. So these were the characteristics we were looking for in a new horse. Fortunately I found two potential candidates straight away on the GHC website - both of them were listed with a height of 1.80 m and they also met all the other requirements and looked very promising in the videos. So, Mr. Kreutz put us in contact with the GHC partners and we combined the search for horses with our holiday. We really liked the first horse: Mr. Drop had the gelding around 18 months in training and was now looking for a buyer for the 5 1/2 year-old. He showed himself to be very rideable and, thanks to his rhythmic and lively gaits, we were left with a very good impression of him as we continued our journey. The next horse was also a gelding that was very much in line with our requirements, although he was only just four years old and had not been under saddle for that long. The choice was therefore not particularly difficult and we took the first horse to a pre-purchase inspection. And so the decision was made - we would like to thank Mr. Kreutz and GHC for their friendly and excellent assistance; the organization was everything that one could wish for and we were provided with all the information we needed. We would also like to thank Mr. Drop. As a result of his excellent work, we have acquired a horse that has had the benefit of an impeccable and very solid basic training. We intend to continue cooperating with Mr. Drop with regard to the horse's further development and training. We would like to thank everyone involved and are more than happy to recommend GHC to others." 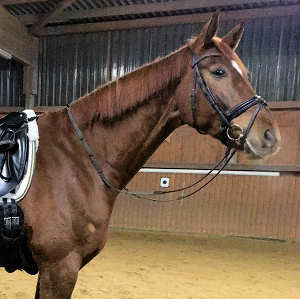 "I was looking for a warmblood to purchase as my next dressage horse, and thought as I was already in Europe on a holiday from Australia, it might be a good opportunity to find one. I found it incredibly difficult to find quality horses for sale, or someone who would be willing to help me source such a horse. That was until I connected with German Horse Centre. From the minute I contacted them I felt safe, comfortable and overwhelmed (in a good way) with choice of horses. Every horse I looked at was exactly what I said I wanted in regards to height, age, training and most importantly budget. I could have brought three horses home with me from the selection they chose for me to look at. In the end we chose the one I loved the most, but I'm still thinking of the other two! If you are looking for someone you can trust in Germany to find you exactly the horses that suit your requirements and budget, German Horse Centre is the right place. 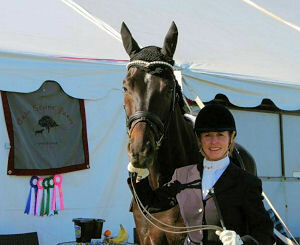 Tiffany with her dressage horse Hanseat/Hendrix II after the successful show. "I love my sweet Hanseat. He is such an awesome horse in the ground and under saddle. We are having a blast together. Hanseat was victorious in his third 4th level dressage test with a score of 71.625% with my trainer Jenny Baldwin." 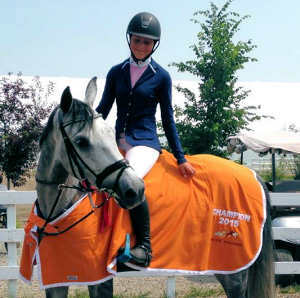 Joceline from Indonesia found her perfect show jumper via GHC, the 1.30 m class placed Chianto/Chosen One. "At first, i heard about GHC from a friend of mine in Indonesia. I was currently on my study in London. My friend gave me Stefan's email address and he is such a friendly person always replying to my emails. He recommended me some horses based on my preference and I took 2 days horse tour with Stefan. It was a wonderful experience. Stefan set everything up and organized the schedule really well. I met my lovely boy Chianto on the 2nd day. He was the last horse on the list and I remembered Stefan said "I think you will like this horse. He is a really nice horse and i think is perfect for you. This horse is one of my favorite" and when I tried him Stefan was absolutely right. He is everything that I need for. A very nice, scopey and careful jumper. I'm really happy I found him and my GHC service is really satisfying as well. If I'm looking for another horse I'll find Stefan again for sure." Solo Hit Song (St. Elmo's Fire) with Roberta on his very first show in Canada. "Solo is doing great, enjoying his time on pasture everyday and working well. The judges loved him and a lot of people saw his talent. I'm very excited about the future! He is still as playful as ever!" "The latest news about our beloved 'gazelle' Daisy Jane. We achieved 14th place in our first show jumping test and then even reached 4th place in the next test - and the competition was strong. Fantastic!." Daisy is a lovely, sweet and sensitive companion. She is quite simply a beautiful horse with a big heart. With her sleek, small head and her fine but very sporty appearance, she attracts attention wherever she goes. Charmian with her dressage horse Luigi Notaro. "I received very professional and friendly assistance from German Horse Center when looking for a well-trained and well-behaved dressage horse. I would in particular like to thank Stefan Kreutz, who helped me through the entire process of selecting candidates, making travel plans, carrying out test rides and pre-purchase inspections, and arranging transportation following the purchase. Luigi has already settled in very well and I am particularly pleased that LUI is also really well-behaved when hacking out. He is a real confidence giver and mentor, and I have already fallen in love with him." "A short note to let you know, that I am extremely happy about the purchase of Sterntaler (Oldenburg 2008) , the mare I was able to buy in Germany thank to the support of the German Horse Center. First of all the mare is above my expectations, she is really a qualitative horse, elegant, good looking, with outstanding gaits, willing to work, docile and intelligent. Your trip organization allowed me to try many different horses in a short time, and choose the right one! I appreciated the perfect organization of the tour and the quality of the horses I was able to try. Your partner stables got the right information and did an excellent job presenting prospects with the quality and characteristics I was asking for. I am enthusiast with the result of my travel to Germany." I am more than happy to endorse your German Horse Center! My experience was entirely positive. Horse shopping is always a bit nerve wracking. Even more so when you don't know the people who are showing you the horses. Also, I wasn't even sure what I was looking for, as I had not ridden much for some years, and I was not very fit. I only knew that I wanted to return to Eventing. At the Partner barns everyone went out of their way to help me figure out what I was looking for, and each went out of their way to extend hospitality- booking rooms, giving us driving directions, and even making dining reservations, or asking us to stay for dinner! The horse I bought was an unlikely choice at first glance; only four years old and with no jumping experience. Julia had already seen me ride and so wisely had me try Don Charming on the lunge line first. This was not in the least offensive to me, I would have done the same in her place. But as soon as he trotted, that was it! - goodbye lunge line! It's funny how you can recognize a horse that you've never met before. During the vetting, shipping arrangements, and payments, nothing was too much trouble for Julia, on our behalf. I cannot imagine a better Ambassador for the German Horse Center, or indeed for Germany. Don Charming is a lovely fellow, and has inspired me to regain my riding fitness. He is a careful and bold jumper. His first Event is next month. I will send you a photo of him in action from there. I would ( and have) absolutely recommend the German Horse Center to anyone. The integrity of those involved is impressive, and the hospitality was lovely." “I am very pleased with Flic Flac - he is better than you stated and in addition has a lovely character. Flic Flac arrived safe and sound. He is certainly better looking than in the videos (where he looked good anyway) and appears well mannered. I will keep you updated on progress. Dressage horse Fiderking enjoys now his life in France. "I am very happy, because I had only one day to spend in Germany...and the great organisation of GHC, found me a wonderful horse! Chris with Cancaro at the Devon horse show. "I just wanted to take a minute and update you on the current status of the great horse you helped me purchase and bring to the states. Cancaro has turned out to be a truly great partner with an unbelievable mind in addition to his talent. We have shown a few times and done very well, with his first outing resulting in a win with a 74%. I am grateful almost daily that he continues to demonstrate a total willingness to work and improve. The latest pictures I'm sending you are from the Dressage at Devon horse show 2 weeks ago, where he pinned second in a class of 6 yr olds suitable to become a dressage horse. I took him mainly for the experience and was very very happy to place so well, especially in the midst of 350 horses including mares and babies, stallions and performance horses. My plans this season include returning to Florida for 5 months to continue working with Lars Peterson where he has already established himself as a great prospect. Chiva with her new family. Many thanks for the quick and professional help you gave us when we were looking for a new horse. When I submitted an enquiry to you a couple of weeks ago, I never thought that I would receive a number of suggestions so quickly. Chiva is the ideal horse for us. With her it is possible to ride beautiful (elementary / medium) dressage movements, as well as simply hacking out in relaxed fashion. She is a real confidence giver – my 4-year old daughter has already sat on her a few times and thinks it is fantastic how well-behaved Chiva is. GHC works very professionally and discreetly; this gave us a good feeling and a sense of complete trust. When looking for my next horse, I will definitely contact Stefan Kreutz and the team again. I wish you every success for the future." The talented dressage horse Hanseat/Hendrix II continues now his career in Colorado. 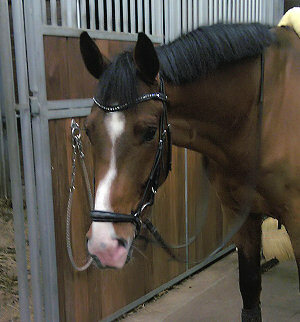 "Stefan, Tanya and Fabian did an amazing job of helping me find the right partner in Hanseat, my 6 year old Hanoverian. I had never purchased a horse overseas before and the German Horse Center made it a perfect experience. Even after my visit, they assisted with the contract, vet checks, and most importantly, the logistics of flying our horse back to the US. The German Horse Center is a first class company who I would feel privileged to work with again." Indiana with her dream dressage horse Don Sandro. "Stefan and his team were fantastic in providing many horses to trial and were outstanding in responding to changes along the way. My trainer and I had spent a day trialing privately sourced horses and it was clear that we needed to change the criteria of our search. After speaking to Stefan, less than 24 hours later, he had contacted all partners and managed to source as many new horses that fit the criteria. That was the real benefit of having the German Horse Center network of support. If we had not had that, the entire trip would have been a waste of time and money. In the end, I had three very good horses to choose from, all of which were terrific options, but decided on Don Sandro. The service delivered by Julia at the partner stable Ludwig Kathmann was very friendly, professional and attentive. There was no question unanswered and no request unfulfilled. 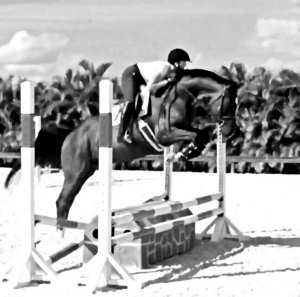 Don Sandro is my dream horse. There have been no surprises. He is exactly the horse that was presented to me and I am so happy I chose him! It was a real pleasure to work with everyone at German Horse Center, as well as their partners, and I would not hesitate to recommend them!" 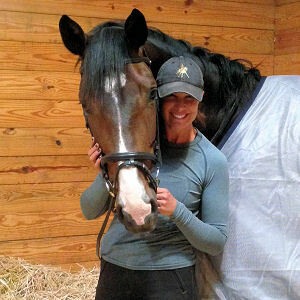 Dana and Make 5 - formerly Arkus - straightaway successful in the United States. "We wish to offer a glowing testimonial and heartfelt thank-you to Stefan and the entire German Horse Center team for a simply outstanding process, service, and result, in our finding our fantastic new jumper! We have found out from experience that GHC is the very best way to buy a horse in Germany, and we highly recommend them! Professionalism: Stefan and the team have created a very unique and personalized experience for the entire family. Everything (and I do mean everything) was taken care of for us and the experience was more than just first rate horse shopping; it was a great vacation too! Stefan is a tireless professional with working out all the details of the trip before you travel. He answered so many questions, is very flexible with family, and was a fantastic tour guide. Language is no barrier at all as Stefan and everyone else we encountered spoke great English. The accommodations we stayed at were all set up based on the specific horses we selected for riding and Stefan customized this to the best use of time and our liking. We just cannot convey enough how excellent GHC was through the entire process. Quality & Value: GHC has assembled the finest group of breeders and partners we have seen to provide a wide range of excellent horses to meet every need. 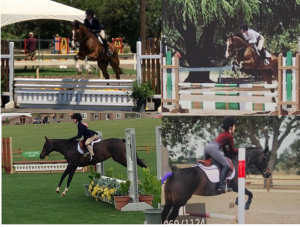 The quality of horses we rode at the GHC partners was outstanding. The GHC website did a wonderful job with information and videos on each candidate and each horse we visited was just as advertised in the website. We were not disappointed in any of the horses we rode. The big advantage to a U.S. rider to horse shopping in Germany is the large number of top quality horses at several different partners keeps prices reasonable. Price transparency is also appreciated. We knew the price for each horse before we rode them. Unmatched Selection: To find the right horse for a serious rider involves matching on many different levels. To do it right, you need to first start with a large number of excellent candidate horses to choose from. The GHC process excels in this and we started with over 43 potential Geldings that met our needs. We planned our trip to ride the best 15 and we narrowed that down to 4 we really loved by the third day. The biggest problem we faced was picking only one. But after this process we confidently know we obtained the very best jumper and match for our rider. Trainer: When our trainer could not attend the trip, Stefan helped us hire a trainer for the horse riding and selection process. Mr. Franz was simply fantastic working with our daughter and helping us evaluate every aspect of each horse we rode and assuring a perfect match. The trainers in Germany are schooled in the profession and that made a significant difference. There was consistency in the discipline. He was so good, we attempted to import him as well! New Friends: On our trip with Stefan and Franz to ride the different horses, we had so many great times, staying in castles, visiting museums, investigating the beer gardens, and seeing the wonderful sights. We made this into a family event, even Grandma came along, and Stefan and team were the perfect hosts. Germany is such a fantastic historic and friendly place. Everyone is always smiling. I would not hesitate to recommend the GHC to other riders for their next new horse. Even after the purchase, we keep in touch with the GHC team. They were fantastic, and we look forward to visiting again and repeating this process! So many thanks for a tremendous effort and a tremendous horse!" "I cannot say enough good things about the German Horse Centre but I will try. I have been looking for a special amateur warm blood jumping horse for over a year. My search took me to Belgium, Holland and France but with no luck and a lot of stress and heartache from horses not passing the vet test and dealing with less than honest people. After a particularly disappointing weekend searching in Holland wth my husband, we decided to contact the German Horse Centre because of the enormous amount of outstanding reviews we read and their professional, clear and informative website. We were not disappointed. Stefan was polite and professional and sent me a list of suitable horses for me to review. From there he established a precise and well planned itinerary for our trip and we met in Dusseldorf the following week. The first day was planned extremely well with and packed tightly with 4 partner stables to visit but Stefan still found time to stop in a lovely hotel along the way for lunch which was much appreciated! At every stable we met good professionals, amongst which were Marten Frehe-Siermann, and Jens Baackmann. 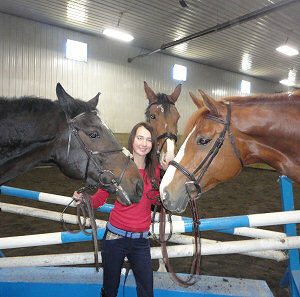 They took the time to coach me riding their horses and gave me advice and opinions on which of their horses suited me. They also brought out other horses that had not previously been on our list that they felt could be right for me and I tried several that were excellent. It was at the last partner stable however that I met Phillip Baumgart and saw Chardonnay, the five year old grey stallion that I was going to ride. 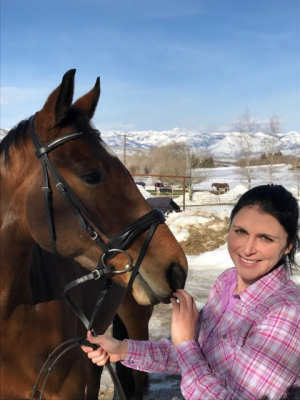 I firmly believe that finding the right horse for you involves feeling a special connection and I cannot explain why, but I knew it the minute I laid eyes on him. I tend to be a little anxious in the saddle but when I rode Chardonnay we just clicked. He has a great personality, very sweet but intelligent, laid back and with a lot of talent. He is also beautiful and with an outstanding pedigree. I still cannot believe that he is only five years old. We managed a course of jumps together and I couldn’t stop smiling. We discussed the horses I tried that day with Stefan over dinner and I was looking forward to meeting our independent purchase advisor the following morning. Having made a mistake buying the wrong horse in the past with no advice, we wanted a separate honest and professional opinion. Martin could not have been better. We had already read his impressive bio on the German Horse Centre website and knew that he was more that qualified to help us. He arrived at our hotel in the morning and we discussed the 3 favourites that I wanted to try again and set off together. Martin is very refined in the saddle a pleasure to watch. He trained me and also rode each horse himself to test their abilities and make deliberate mistakes that an amateur would make to test their reactions. He was able to give us invaluable advice about the horses and also point certain things out that I would never have been able to see. Apart from that, he is a very nice and genuine and dynamic person and by the end of the day I felt that I had known him for a long time. 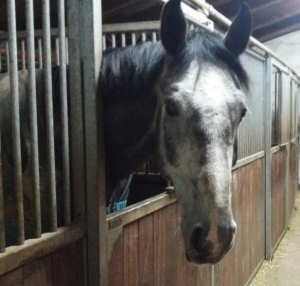 Martin thought that there were 2 horses that suited me the best, Chardonnay, and another beautiful and sweet grey gelding that I tried a Jens Bacckmann’s stable. It was an easy choice because of how special I know Chardonnay is. Naturally he passed the vet test performed by Dr. Brunken with flying colours. Philipp has agreed to let us keep him at his stable and continue the excellent training that he has been receiving with him for a few more months after which time we will transport him to France. I will also go back to Germany to train with Philipp myself for a week which I am really looking forward to. I never thought that I would be lucky enough to have such a special horse and am looking forward to a great partnership with him. One of the reasons why I feel that Stefan delivers such a high quality service is because he has been in the same position when looking for a horse and perfectly understands the point of view and position of the buyer. We all want a horse that has the best qualities, but we also want to buy with confidence, knowing that the horse we are taking home has been trained kindly and correctly and that is something that Stefan takes very seriously and is able to deliver. It was a great pleasure to have met him and to have had the opportunity to buy our horse with his help. I cannot recommend him and the German Horse Centre highly enough. " "Buying a horse abroad is like looking for a needle in a haystack so i would like to thank you for the great service. The whole experience was easy, completely stress free and I enjoyed the opportunity to try a number of different horses chosen to suit me and my style of riding and because of your personal service we were able to fit alot more into our visit than I had envisaged. Also the question of vetting and transport was totally hassle free. Everything aspect was covered and I wouldn't hesitate to use the service again." We received photos from Pietro and his young mare Doriana on their first eventing competition in Italy. Thank you very much. "Coranella and I are doing just great. She is a fantastic horse and we have already competed together for the first time (4th place). 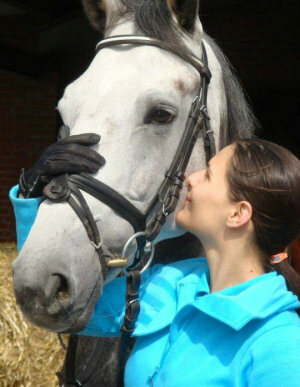 A truly sensational horse…"
Miriam with her lovely dressage horse Shalino. "Many thanks for your great service. It was fantastic to be able to test a number of horses in one single stable, all of which really lived up to my expectations. And Shalino provided everything I wanted in a horse. Anytime I am looking for a new horse I will use German Horse Center. (…) I have only really experienced such service from American companies before. It is great to see that there are also people over here that prioritize customer satisfaction. " Claudia and Caruso did their first 1.00 m class. They won both days in the juniors category. Congratulations. I wanted to share this great weekend of competitions with both of you. Claudia and Caruso did their first 1.0 meter class this weekend and they both did an amazing job, Claudia was able to get first place on both days in the juniors category and she got the third best time yesterday in the open category and the second best time today in the jump-off in the open category out of 30 competitors. I truly want to thank both of you for such an amazing horse, they are having a great time together and I am sure that they will make a great team for many years to come." GHC was exceptional to work with. As a business owner myself, I truly appreciate the professionalism, responsiveness and genuine care that GHC takes of its clients. The entire process was nothing short of fabulous. I came to GHC with a unique situation and a big request for a specific type of horse. I cannot say enough good things about Stefan’s responses and coordination for every step of the way. And when it came time to deliver on what I had requested, trainer Martin Fink was fantastic. He went above and beyond to ensure he found exactly was I was looking for. His sense and feel for the horses was spot on and his dedication in finding me Colmar will be appreciated for a long time. 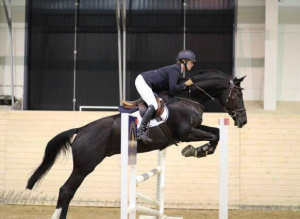 Colmar is a gorgeous 7yr old that has been a great addition to my jumpers. I have no doubt we will be breezing through the 1.45 by the end of the year. I will definitely be back to GHC and Martin for my next one! Lightening McQueen starts now a career in the United States. "Lightening McQueen is an amateur rider's dream. He is brave, kind and easy. 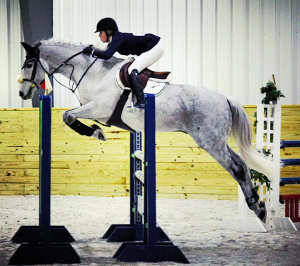 Combine this with enormous talent and scope and I am honored to have such a nice horse." Monty has already settled into his new home. "Many thanks to German Horse Center for the detailed planning of the horse tour. Everything ran very smoothly and we were made very welcome by and received great help from all the partners. Monty has already settled into his new home and provides us with great pleasure. Many thanks also to the very kind GHC partner for the good advice and for the straightforward and rapid processing of the sale." "I just want to inform you, that I have competed with Monty on two show jumping tests for young horses (1.10 m). He has won both tests with a score of 8.0. and 8.6. I am so happy. Thanks you so much for this great horse." Vanessa and her horse Fritz home at Con Brio Farm, Ontario, Canada. "We searched for two years and travelled on two continents and, thanks to the German Horse Centre, my daughter finally found her equine soul mate. It only took 15 minutes riding Freiherr, a beautiful talented 16h2 Hanoverian gelding, for Vanessa to realize she had found the perfect junior jumper.We would like to thank, in particular, Stefan Kreutz, with whom we corresponded for several months prior to our trip to Europe. Stefan always returned our emails and calls promptly. A week before our trip Stefan sent us a detailed itinerary outlining the stables and listing the horses selected for my daughter to ride. He also recommended a delightful small hotel in Warendorf called Il Cavallino, next door to the National Equestrian Olympic Training Centre. We would also like to thank Stefan for helping to arrange transport home for our wonderful new horse.Freiherr (Fritz) has settled in well at Con Brio Farm near London, Ontario and he has proved to be everything we could have hoped for in a horse. He is gentle, friendly, business-like in the ring and super talented.We are grateful for the help we received from the German Horse Centre." Georgia with her lovely mare Cassia. "When I started looking for a horse, I immediately thought of Germany as the most convenient way to find a perfect sport partner and when I saw the GHC website I was immediately impressed by the graphics and the great clarity with which each horse was described. I wrote asking for something very precise: a jumper for a young amateur rider with a gentle character, who would allow me to enjoy every minute of riding and grooming. GHC immediately prepared a list of horses that would suit my requirements, and when we arrived on the locations in Germany I tried extra horses that the partners chose for me when they saw me riding. I was amazed by the number of quality horses that I was able to see in such a limited amount of time and with a fixed budget. We were also surprised by how well Stefan organised our two day horse tour (with my mother and even our dog!) allowing us to maximise the time we spent at each partner. The facilities we visited were extremely well-kept, and all the partners professional and friendly. During the horse tour not only didn't I feel out of place without the help of my trainer, but the partners also gave me advice on how to ride their horses and their opinions on whether they thought their horse was the right match for me or not. At the end we found three horses that met my requirements, and I regret leaving two super horses (Scooby and Francis) behind… but I only had to choose one! Jule and Marten were very accommodating and allowed me to test ride Cassia, the beautiful 8 year old mare that I chose, under every conditions I asked for: even changing the bit and hacking out…! They were very honest about their horse and I am now very happy to have her at my stable here in Rome. Cassia is the perfect Confidence Giver, with a stupefying pedigree that makes me even more proud of having her here with me. Both my trainers are astonished by the degree to which they think Cassia suits me, and by how relaxed, honest and intelligent she is. A big thank you to GHC, whose professionalism and great choice helped me find the horse of my dreams. 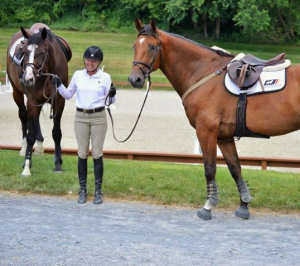 I will definitely recommend Your service to any demanding buyer looking for a Sport Horse!" 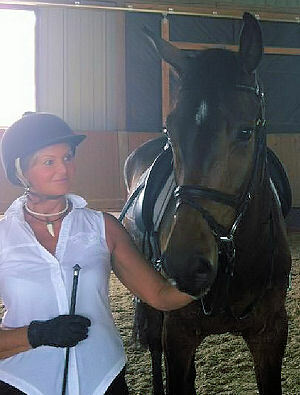 Joanna with her dressage gelding Eli. "I want to extend my appreciation to you, Tanja and Stefan for the exceptional service I received from German Horse Center. The professionalism of the GHC staff made the purchase and import of my new horse absolutely painless. I have only good things to say about the seller, Jens-Peter Rabeler; the veterinarian, Dr. Brunken; and the transport company, Peden Bloodstock Transport. As you know, I chose to purchase without making the trip to Germany and the willingness of the seller to provide me with up-to-date photos and videography, as well as answer all my questions was wonderful. All aspects of the pre-purchase vetting, writing of sales contract, purchase and scheduling transport went smoothly – what a pleasure it was to do business with you! I wanted to let you know that my lovely 4 year old Hanoverian gelding has settled right in. His registered name is now "Longinsel" which is German for "Long Island" (this is where we live in New York), and his barn name is "Eli". He is absolutely everything I expected him to be from the representations made by GHC and JP Rabeler – I am just thrilled with him. I have attached a photo of Eli, taken shortly after he was delivered to my barn. Thank you again for all your efforts on my behalf and I will be sure to consider GHC for future purchases and recommend you whenever possible." 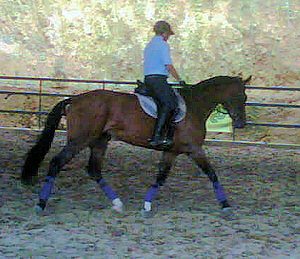 Anna with Sanara in a dressage test for young horses. "Quality, expertise and great service are what makes German Horse Center really stand out. When I was looking for a dressage partner for my 14-year old pupil Anna Herb, I wanted a horse that provided reliability, beauty and rideability. German Horse Center was a fantastic partner when it came to finding just the right horse, as well as testing and finally acquiring it. 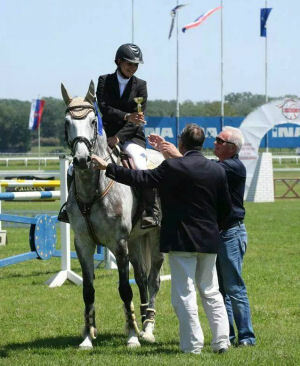 After purchasing Sanara, she immediately won two dressage tests in Austria. One dressage test with the pupil Anna and one test with the trainer. Congratulations! We are very happy that Anna Herb now has the 6-year old dressage mare Sanara, which we purchased in September 2012. Many thanks to Stefan Kreutz and Tanja Uredat for helping us find our dream horse and for the fantastic service provided by German Horse Center." "We wish to thank you for the well organized and thoroughly planned personal horse tour we had with German Horse Centre. Everything was professional, all the barns were top standard and the horses of supreme quality. We called it the most confusing tour ever as we didn't know which horse to choose as all the horses were so carefully picked that they suited us perfectly. After choosing our horses we felt guilty for leaving the others behind. Thank you for a wonderful experience and for the excellent horses we are now bringing home to South Africa. We will keep you updated on our progress and look forward to buying more superb horses from you in the future!!! German Horse Centre is on top of our recommendation list for anyone wanting to buy horses in Germany." "Giovanni is great! From day one he has been a class act. We love him, and are very excited to start his new career. Working with German Horse Center was great from start to finish. Thank you for this very special horse." "A well-organized horse tour, expert partners and well-trained horses at the stables – and we had luck at the very first attempt! We are very happy to have found this excellent young horse, which also has a great personality and a very clean bill of health. Many thanks and we wish you continued success!" Daugther Carolina with her sport pony Momo. "We all have great fun with Momo. My daughter can now really learn to ride with him and she is already looking forward to the upcoming competitive season. All aspects of the purchase of Momo went very smoothly. Many thanks with your help in organizing everything!" "Carl the Great" (Carli) at his very first dressage young horse test. "A very well organized tour featuring interesting horses upon which one could really focus without any distractions. We were met by the very pleasant and professional GHC partner and we are excited and happy that 'Carl the Great' has now arrived safely in his new home. He is a great horse! 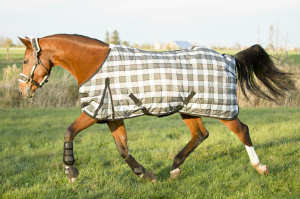 Many thanks to GHC and to all the horse lovers – highly recommended and trustworthy." Chris with his new dressage gelding Cancaro. "After exhausting my resources here in the States looking for a young dressage horse and reviewing the German Horse Center website several times I decided to contact them. I did not have any references other than the testimonials, but the several emails back and forth between Tanja and myself, and subsequently Stefan and myself all were very positive and encouraging. They assured me that they would be able to show me at least 20-25 horses that fulfilled my requirements which were specific.I wanted a 3 or 4 year old young tall gelding that had a lot of promise. Plans were made and the schedule determined so I flew to Frankfort and then Dusseldorf where Stefan met me and took over. His itinerary was full and very well planned and organized. In three days we looked at least 25 horses that were all very nice young prospects. I rode nearly all of them with only one or two exceptions and this was based on just a personal preference, not that there was anything wrong with them. Once we were finished we established a list of 7 horses to ride a second time and establish a priority list. We completed that effort and I flew home. Once I was home, Stefan arranged the vetting for my selection. That being done, he arranged the flight and all the contacts for quarantine and the horse’s eventual transport to my barn. This entire search was conducted in an extremely professional, well organized and courteous manner. The barns were all top-notch and the horses were extremely well presented. Not only did I find a super horse, but I made a new friend as well. I would not hesitate to do it again!" Alejo with his mare Perrin. "I came to German Horse Center upon a recommendation of a club mate who purchased a very nice horse from a GHC partner stable one year before. The communication and horse selection for my requirements were excellent from the beginning. GHC suggested several additional fitting horses and organized a very worthwhile 3 days horse tour during which I tried a great number of horses and all the partners were very accommodating and showed me even additional horses on location when viewing my riding. Stefan as my Personal Tour Guide was gentle and flexible and made the search a smooth and comfortable event. We maintain now a friendly relation. The selected hotels were excellent. We had a very good time and the stables were very nicely kept. Finally I had to decide between 2 very nice horses and really fell in love with my brilliant new mare Perrin which would jump over fire with me. I already entered some first shows with her and am very happy. I would highly recommend German Horse Center to everyone who searches for a high quality, well trained horse from Germany." Miriam with her dressage horse Dublin. Dublin lives now really in Ireland. 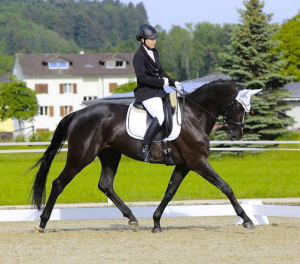 "I was looking for a dressage horse and was recommended the German Horse Centre by a good friend. They organised the whole trip for me and were able to suggest horses for my specific needs, as I am not a very confident rider. When I saw Dublin he was absolutely stunning; the photographs on the website did not do him justice. Everyone we met on our trip was extremely friendly and helpful. The GHC also recommended a great transport company, and Dublin arrived in Ireland safe and sound. I would highly recommend the German Horse Centre." "The horses arrived safely today! They are more beautiful than I remembered! Thank you so much for your help, and organization. It made everything go so well. Sandy and I both enjoyed our horse shopping adventure. We hope to make another trip in the future." "Wiltina has settled in very well and I am so pleased with her! 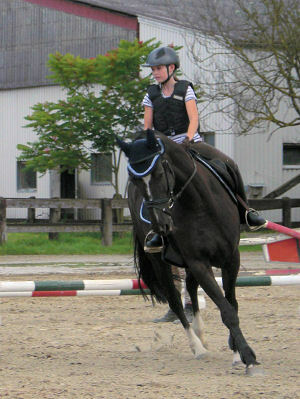 I was very satisfied with German Horse Center and will happily recommend your company." "Everything went fine, and couldn’t be better. We had our first competition today and were already placed as first reserve. I am very happy. We wish you and your team continued success and will also gladly come back." Daugther Lea with Primera. She will enter her first show shortly. Good luck! "Everything went great and Primera is a very, very sweet and wonderful horse. We must remember that our daughter is only 10 years old. She saddles and unsaddles the horse alone, 'showers' it after riding and, even as a total 'non-rider', I find Primera really great." "Checko is doing great. He has the best mind of any horse I have worked with. He has gone to three shows so far and has gotten a lot of blue ribbons already. At home he is a joy to be around. Nobody can believe he is only five. Thank you to the German Horse Center team for all their efforts!" Vanessa with her show jumping mare Queluz. You provided fantastic service in helping me find a new horse. It was wonderful to work with German Horse Center; what your customers want is important to you and you do everything possible to meet their requirements. The partner stables were all very pleasant and welcoming, and there were great horses available at every price level. All the partner stables went out of their way to present the most suitable horses available. The hotels that you arranged were excellent and we really felt at home there. The whole tour is something that I heartily recommend." "I will always contact German Horse Center when purchasing a horse, as it is a very professional business that takes its work seriously. One receives all the help and assistance one could want with regard to viewing and trying out the horses etc. I would like to say thank you once again for the excellent service." " I am so happy that I found this website, it made my life so much easier! When I decided I want to buy a new horse and I started looking around for a good one I was told it is extremely difficult to find what I needed: a young, well schooled, talented horse, but soft and calm at the same time (I am not very experienced amateur rider). But to my surprise the German Horse Centre was able to recommend me four horses to fit my requirements! The trip was excellently organised with all horses ready and waiting for me according to Stefan's itinerary. I am also very grateful to all the people who helped me during my trials, their advices were invaluable! The most difficult part of the process was actually choosing the horse as they all were very good indeed. I chose the beautiful black mare, she has been with me for almost a month now and I am absolutely delighted to have her as my future dressage partner! She is exactly what was said about her on the website. The German Horse Center helped me with a vet report to satisfy my insurance company and they organised the horse transportation company to deliver the horse to UK. I will highly recommend this company and will definitely use it again in the future." "I can honestly say that it was top class service from my first email to the delivery of my horse and the follow up after he was delivered. I have been buying horses for many years and unfortunately the horse buying process is very tricky as most dealers are very dishonest. The German Horse Center is the most amazing source for buying horses in Germany. After giving Stefan my brief I was sent about six horses to look at. I found two on my first trip and went back a second time to try them both. It was a very difficult decision on which horse to buy. I was hoping one would fail the vet so the decisions were made for me…but unfortunately they both passed so I had to choose! I will certainly buy more horses from the German Horse Center and will happily talk to anyone who wants more details on how easy the process was." Zack, the new dressage prospect from Kathleen. "The German Horse Center is a great resource for knowing you can safely and relatively easily purchase a horse in Germany. You are in good hands from beginning to end, and will have support throughout the entire process. Also you will see the best horses as they have connections to top sources. The breeding and quality available is excellent, and the prices are fair. I know many people worry about paying multiple commissions if they go through several steps to find a horse in Europe but with GHC this is definitely not the case, as they offer full disclosure and you really are buying directly from the sources. Mackenzie, proud owner of 3 new successful show jumpers. 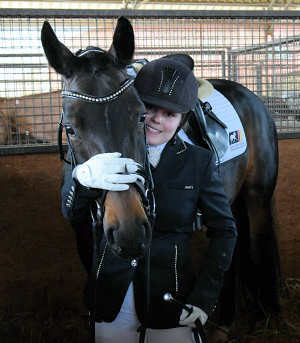 "My trainer Kim and my family went to Germany to find a jumper for me in the summer of 2011. The German Horse Center organized a superb 7 day long tour of different stables to find the perfect match for my riding ability. However, we found so many suitable horses; we simply couldn’t pick just one! I am now the proud owner of 3 beautiful horses. Our tour guide, Stefan, was very helpful, and knowledgeable. We had no stress in organizing our trip at all; the German Horse Center took care of everything! When we purchased the horses, the German Horse Center provided full assistance with organizing the vet checks and arranging their transportation to Canada. I highly recommend using the German Horse Center for finding a sport horse in Germany." Saskia with her perfect jumper Cosima. "German horse center was exceptional. From the beginning both my grandmother and I felt welcome and prepared. We were met at the airport and were immediately given a folder with the schedule and a list of horses, as well as all the times we would be waking up and all the hotels we would be staying at. It was superbly organized and very well thought out. We were never late and we were always ready to look at a huge selection of horses. Stefan was an excellent host and so prepared to help us out in any situation. He was patient as we tried horse after horse and also filmed each horse I tried. Over dinner, we would review the horses I had tried out and pick out some that we enjoyed and might want to look at again. Every horse I rode was of excellent bloodlines, of great caliber and so well trained. The men that were selling the horses all had great skill and were always willing to give me advice on the horses I was riding. I ended up with my excellent new mare, Cosima. She is a five-year-old Westphalian who helps me more than any horse I have ever met. I could not have wished for a better experience or a better horse. I love her so much and I’m excited to cherish every moment together. I endlessly thank German Horse Center for helping me out in my quest to find the perfect jumper. I will most definitely recommend you to anyone that is looking for a horse, as you are efficient and so prepared to meet anyone’s needs." 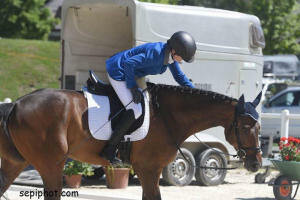 "I bought a horse through you named Cosima L a little bit over 1 year ago. I just wanted to send you a couple of pictures to show you her first 1.35 meter class! She has been going great and is now competing in the 7 year old classes with very good results! She is a winner! I have decided to keep her and bring her along, and will be getting a Grand prix horse for myself this summer!" 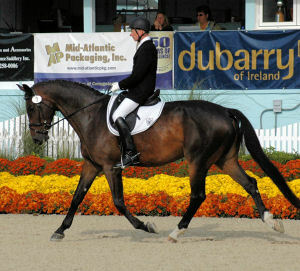 Caroline's dressage prospect by Don Romantic. "Our horse tour was very well organized. The selection of horses matched our search criteria exactly. Over a short period of time, we were able to try out many quality horses, we felt welcome wherever we went and received great expert advice. German Horse Center was also very helpful in finding a hotel for us. We found an excellent young horse and are very happy with it." Anke with her show jumping prospect Prophan. "Thank you for the great support. We all had an excellent time and we will remember these three days happily. My horse, Prophan, has already settled very well and, every day, we are exploring a little more of our area. Everyone loves him and I am looking forward to spending many more enjoyable years with him." Two happy dressage mares in Poland. "Thank you again for all your time and work and thanks to everyone in your team. The trip was superbly planned and organized: it was great that we could view and test so many horses in three days – it would have been impossible to arrange that oneself. Most people could hardly fail to find what they want during such a trip. I found what I was looking for relatively quickly and am now looking forward to next week, when my two new mares will be arriving in Poland. I would be very happy to recommend you to others and will of course be in touch the next time I am looking for a new horse." Andrea and her mare Kaiserin (formerly Kaisertocher) in Germany. "Looking for a young talented dressage horse was a pleasurable experience with the German Horse Center. It was great to view videos of so many nice quality horses online. I traveled to Germany earlier in the year with a trainer friend that was horse shopping. We didn’t have the luxury of previewing horses before the trip and spent a lot of time driving around. When I contacted the German Horse Center I knew I was ready to plan a trip based on the number of quality horse videos I previewed. From the first contact Stefan was very professional and great to work with. I can’t say enough good things about his attention to detail and level of professionalism. The personalized itinerary was great. Stefan put together a detailed schedule and we were continually amazed when we arrived at each appointment on time, even with a few tack store stops along the way. The German Horse Center partners were all wonderful. The horse owners and trainers were all very friendly and helpful and the barns were truly amazing. We enjoyed the accommodations and restaurant recommendations as well. We were lucky enough to find my new horse early in the trip so I was able to vet check her and ride her a few more times while I was still in Germany. We had time to take in a Foal Show and saw a lot of beautiful countryside along the way. A big thank you to Stefan and the German Horse Center. I look forward to the arrival of Kaiserin and to showing her next year." High level jumper Casio with his rider Katka and her familiy. Katka was placed immediately on her first show. Congratulations! "Normally we do not provide testimonials; we believe that we are entitled to a good service and a quality product, after all we are paying for that! In the case of the German Horse Centre however, we are happy to make an exception. Our whole experience with Tanja and Stefan has been absolutely perfect, way exceeding any reasonable expectations. The whole process, from the moment of the first contact, via arranging the visit in Germany, lining up an excellent selection of horses, testing, providing an independent advisor, to the actual purchase and arranging transport to our stables in the Czech Republic has been very professional, efficient and courteous. The horse bought has fully lived up to expectations. We have via the German Horse Centre arranged for German trainers, who are flying across on a regular basis to train both our daughters (9 and 12 years). Their progress is excellent. We have just asked the German Horse Centre to source one more Show Jumping Pony and another high level Show Jumper for us. We can recommend the German Horse Centre to anybody who is interested in sourcing quality horses in an efficient, professional and ethical way!" "It is with great pleasure I write this testimonial. The German Horse Center will instrumental in the purchase of my great horse, Passero. Over a period of six months I researched for the ideal horse and your team was very patient. Furthermore your recommendations and stables you sent me to were very professional and the quality of the horses was very high. I used two comparable services and they were not anywhere close to the quality in service or horses they recommended. In a very coordinated manner you arranged the agenda and in comparison to other providers your service was exceptional. Finally I did pick my horse and the process to purchase was possible with your help. Thank you and feel free to offer my details to anyone if they need a reference on your service." Isabel with her top dressage prospect Cicereco. 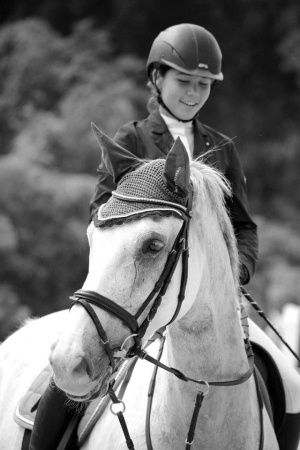 "I am so happy that, via German Horse Center, I was able to find a talented young horse. I am hoping for and looking forward to a successful future together in the field of dressage." Amazing Grace on training for SEA Games Qualification (South East Asian Region), June 2011. "JN Stud, Indonesia, is very thankful to get the professional assistant from GHC and luckily to have 'Amazing Grace' with lot of talents inside and honest. She is really as a Confident Given Horse as published by GHC." A top team: Aleksandra and her mare Cassina. "It was a wonderful experience. Each day was very well organized and enabled us to meet a number of partners, all of whom were very patient and sincere about helping us choose the right horse. We visited several places and met many really good horses. GHC helped me find a mare that really fits my needs in every way. I cannot praise highly enough the professionalism and great commitment that German Horse Center demonstrated in helping me find the perfect horse." Katie with the mare Campina Grande. "We recently purchased two horses through the German Horse Center and cannot say enough good things about the entire process. The German Horse Center has created a model of customer service that is exemplary. We arrived and found several horses that fit our criteria perfectly - so much so that making a decision turned out to be the most difficult part of the experience! The stress often accompanied with international travel was nonexistent as every detail was taken care of by Stefan, including accommodations, transportation, and appointments. As such, we were able to enjoy every part of the process and really focus on the horses. After making our decision, vet checks and importing details were quickly set up. The professionalism and attention to detail that Stefan and his partners displayed was phenomenal. All the horses we saw lived and trained in top notch facilities where the well-being of the horse was of utmost importance. Riding at these facilities was an absolute treat and pleasure! A million thanks and kudos to the GHC for delivering an unbeatable experience." Diana, Katie's trainer with Campina Grande on a show. "Our trip to Germany with the German Horse Center was both productive and fun! Stefan was wonderful in planning every detail of our trip. We went to several beautiful places around Germany and the partners' facilities were very impressive! We were very pleased with the selection of horses and the flexibility of the partners. The partners represented their horses honestly and the quality of the horses was exceptional. We were able to try the horses we liked multiple times and the partners were very accommodating and helpful. We ended up with two wonderful horses, and we can't wait to put them in the show ring this summer! As a trainer, I thought the German Horse Center has a great program for buying horses, and I'm sure it will continue to grow. I will definitely take every opportunity to work with Stefan and his partners, and I highly recommend them to anyone!" Do it for you in his new stable in Switzerland. "I cannot speak too highly of the GHC (German Horse Center) in terms of the advice and support it provides. My first contact involved receiving excellent and very professional advice and support from Mr. Kreutz. And then during my search for a horse in Germany I had the same experience at each of the GHC visitors we visited. Each partner goes out of its way to provide optimal conditions for the horses: we saw no evidence whatsoever of poor conditions or rough handling at any of the GHC partner stables. The schedule drawn up for us by GHC worked very well and we were warmly welcomed at each of the stables. Thanks to GHC, my quest to find a horse was very relaxed and I could really concentrate on the task at hand. 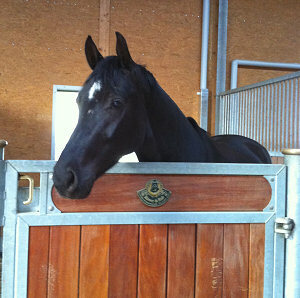 And my dream horse has now arrived safely in Switzerland. Right from the very first day, 'Do it for you' has lived up to everything I was promised. He is a wonderful horse and his charming nature makes him a real favorite in the stable. In everyday handling and when under saddle, he is fantastic and provides joy and happiness every single day. I could not have made a better choice. I would like to thank Mr. Kreutz, GHC and the Klatte Stud Farm for helping me to acquire 'Do it for you'." The mare Rascavelle with her new trainer. "Rascavelle (the horse) has arrived safely and has really settled in. I really made the right choice and she gives me great joy. I thoroughly enjoyed my trip and really appreciated the assistance provided by German Horse Center!" 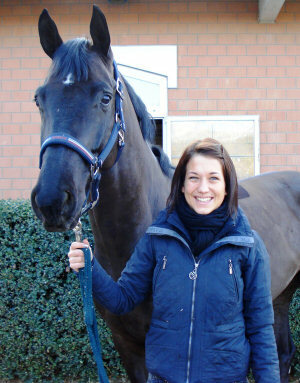 Daugther Sonja with her young and impressive gelding Ferris, We wish a lot of success for the show season 2011! "We were very impressed by the extensive and all inclusive range of services offered by German Horse Center. The team there carried out a professional advance assessment of our requirements before organizing and scheduling visits to a number of carefully selected breeders. This is how our daughter found her dream horse - many thanks for your help." "I found the German Horse Center a pleasure to deal with. Our itinerary was well laid out and we found our yards without difficulty. Everywhere we were met with courtesy and efficiency. The yard where our mare was stabled was so helpful and professional that we were delighted to do business with it. The mare is exactly as we were told she would be. It was a very positive experience." 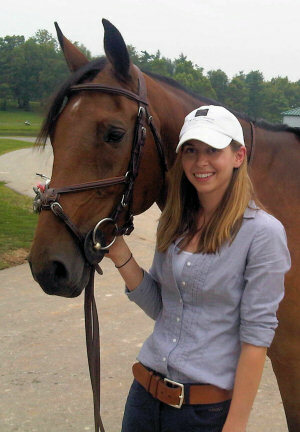 Kaitlin with her beautiful and talented hunter. "... the professionalism, cleanliness and wonderful care for the horses at the German Horse Center was absolutely amazing. Jens took us to many amazing farms and showed us many amazing horses we never could have seen in such short amount of time and proximity in the States. Being as this was my first time making a horse purchase in Europe, I couldn’t have been in better hands. I immediately felt comfortable with Jens and everyone at the farm after meeting them. All of us clients had different requirements of what we wanted in our "Fancy Hunters", especially myself. I had set in stone requirements actually. The horse needed to be no older than 6, no smaller than 16.1hh, a fancy mover, a jaw-dropping jumper and of course all in a set budget. The second I saw my now, new baby walk into the ring I knew he was the one. After being home with me in the states for 3 months now, he has transformed into an even more remarkable horse that I saw back in September. I knew I was buying an extraordinary horse with an amazing pedigree, but he has absolutely exceeded all expectations. He is so smart, so sweet and so breath taking. I am looking forward to this summers show season and growing as a team. When we are both ready, he will be the 3’ 6’’ hunter I’ve always wanted. I plan on continuing my business with Jens and everyone at the German Horse Center for my future horse purchases. For our first experience, it was an unforgettable one to say the least. I cannot thank you all enough for everything you did for us and for finding me the horse of my dreams." "In my opinion, it is the very friendly and personal assistance provided by Tanja and Stefan, the perfect and customer-oriented organization of the service, and the good cooperation with trusted partners that account for the success of the GHC strategy. I was able to view a number of horses that met my requirements over the course of just one day. One of these was the horse that has lived in my stable since August and which gives me great joy every single day. The next time I am looking for a horse, I won’t hesitate to call the German Horse Center team." 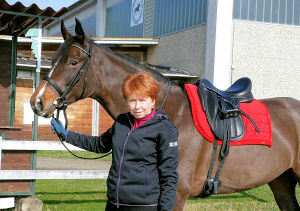 The talented young dressage gelding now lives in Switzerland and will be trained and developed further there. "The three and a half year old gelding has arrived safely in Switzerland. We are all so excited about this great horse. I just wanted to take the opportunity to say again that I think the German Horse Center concept is fantastic and something that I would be very happy to recommend to others. The meetings with your partners were also very pleasant and straightforward." Roberto with his gelding Chelzy. Chelzy is now enjoying the beautiful weather in Florida. First of all I would like to thank Britta (from German Horse Center), because she was the one that helped me from the beginning. Finding a jumper horse is not easy. I saw many horses and visited many barns in my visit to Germany. But when I got to see the horses that German Horse Center offered to many I was very pleased with the quality of horses that they offered me and the difference was clear with other places. After trying few horses I was able to tell which one was for me and now he (the gelding Chelzy Roberto bought) is here in Orlando, FL enjoying this beautiful weather. We are going to work hard so we can show his quality in the show grounds in Florida and I expect we can win many blue ribbons. I definitely recommend German Horse Center. "After fruitless searches for a show jumping horse capable to jump 1.40 m in North America, my trainer suggested we consider looking for a horse in Germany. (…) My mother checked out possible sources, found and contacted the German Horse Center on-line. She was immediately impressed with their professionalism and ease to view all their listed horses. For me, the best part were the videos, as we all could watch each horse in action which helped us select a number of horses to put on our 'to check out' list. Stefan Kreutz of the German Horse Center responded quickly and was most helpful. He provided us with an itinerary to visit our selected horses for our planned August 2010 trip. When we arrived in Germany, we visited 5 stables in two just days. When we were at Sportpferde Jens Baackmann, Jens introduced us to Argentina AS, a beautiful 10 year old mare Westfalian, who wasn’t even on our list. 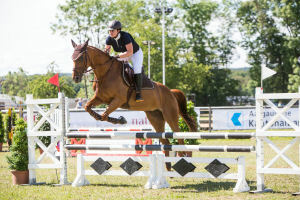 Jens commented - 'I have the perfect horse for you, Katie'…Argentina is calm, very well mannered, superbly trained and has competed in her upper show jumping class, the 1.45 m course. My trainer rode her and whole heartedly agreed! After I rode her, I immediately loved her. I had found my perfect horse…! The whole experience was simply wonderful, we had a great family European holiday, saw and rode many very good show jumpers, but the best part was that I found my perfect Argentina…! Thank you very much Stefan, Jens and the German Horse Center." "I was looking to acquire a young show jumping horse and came across the German Horse Center website purely by chance. I was immediately impressed by the idea, the concept and the way in which the horses were presented. After the initial e-mail contact, I was given detailed information about the horses over the telephone and a very well designed and structured tour was arranged that gave me the chance to really get to know and test the horses in order to find my favorite. Just 4 days after the initial contact, I was able to meet and try out the horses. After a long and very exciting day during which I rode many great horses and met a lot of nice people, I knew I had found the right horse for me. And this is confirmed every day as we have great fun together and learn from and with each other. Our first competition together was a great success. I would therefore like to take this opportunity to again thank Mr. Kreutz and his team for their wonderful support during my quest to find the perfect horse for me." The daughter Paula with her mare Isla. They are one heart one soul. "…I really want to thank you for the excellent support and the professional help you provided in finding just the right horse for us. Your polite and friendly approach really laid the basis for establishing a trusting relationship between us as a client and your partner stable. This is especially important as the purchase of a horse is guided by the mind and also very much by the heart. With your help I was able to find the perfect horse for my daughter and I. Many, many thanks for this and I hope you will have many other clients that are as satisfied as we are. Best wishes and good luck for the future." Shadi with his mare Cozumel in the Dubai Polo Club. "I stumbled across the German Horse center while surfing the net dreaming about finding a horse for me and my wife. We sent a message, honestly, not expecting a reply. Oh, a reply, we did get, a very honest and sincere reply. It was this sincerity and transparency that made me decide to make the trip to Germany to find a horse. My trip to Germany was wonderful. I met such great people and made true friendships. The horses were also outstanding. Up to the last moment, I was still confused between three excellent horses as they met my requirements even possibly exceeding them. All through the buying and shipping procedure the German Horse Center was right by our side. When the horse reached Dubai, Stefan (Director of German Horse Center) came to Dubai for a visit and we had a great time. We also used the German Horse Center to select a trainer to visit us here in Dubai to facilitate the transition for the horse from Germany. All in all, our experience with German Horse Center has been extraordinary. We have a wonderful horse! We made great friendships and we ,honestly, feel as part of the extended German Horse Center's family! 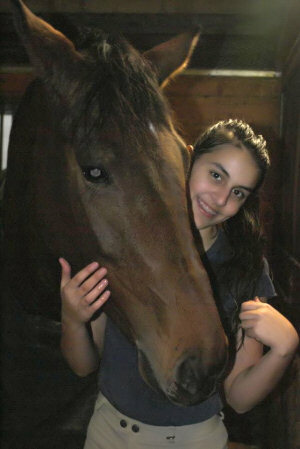 Most Sincerely, Shadi Hassan, the proud owner of Cozumel (Most loved Horse in The World)!" 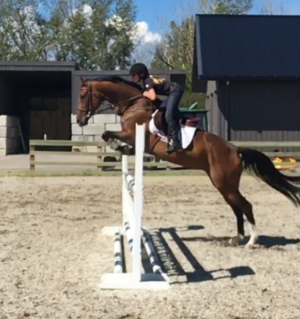 "Just wanted to say thanks a lot for helping us find the super top jumper Sambucco and the lovely mare Gianna :) we are really enjoying her, she brings joy to us every day!! We are very happy to have come across your website, and would recommend it to everyone. We were very surprised how well organized everything is and would definitely come back to buy our next horse with you!!! Keep up the great work; I’m sure a lot of people will find their perfect horse with you! Hopefully see you soon, Désirée and Cornelia"
We received this message from Désirée in December 2010. We wish her and Sambucco a lot of success in 2011: "Here a little update on how Sambucco and I got on in November: in the M1 we were always placed, such as 2nd, 4th, 8th. I'm very happy with him he is such a star :) now I will be going to Malta for 1 month so he will have a bit of a jumping break. In February we will start jumping him again, and in March we are off to Arrezzo for 4 weeks for shows! After that I will always be on tour with him, so hopefully will get great results and of course will let you know how I got on :) I'm so excited!" 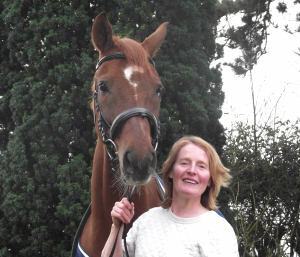 "Just wanted to let you know how pleased we are with the horse we purchased with your help! She is fantastic and exactly what she was sold to us as, no surprises when we got her home! Our trip to Germany exceeded my expectations by far, the effort you put forward co-ordinating everything was amazing; we traveled all across Germany, visited many top show barns, rode many incredible horses and met so many great people. The country side is beautiful, we stayed in some castles and you even organized time for dinner with friends, a trip to a great tack store and a visit to the infamous Christmas Market! While still in Germany we were even able to be present at our horse’s vet check; and by the way our vet clinic here was very impressed with the quality and professionalism of the x-rays. I will return to Germany and use your services in an instant, it was well worth the trip and the cost!" Pam with her Hunter Freeda. 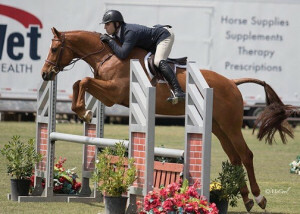 She went to the first horse show in April and competed in the low hunter classes. As you can see, the judge liked her a lot! Congratulations! "My trainer and I went to Germany in December 2009 to look for an amateur hunter with the help of the German Horse Center. The German Horse Center provided a very organized and efficient two day tour of six stables where we saw several suitable horses of high quality. Our tour guide was friendly, knowledgeable and very helpful and our accommodations were comfortable and quiet. When we purchased a horse, the German Horse Center also provided extensive follow-up assistance with the vet check and transportation arrangements. 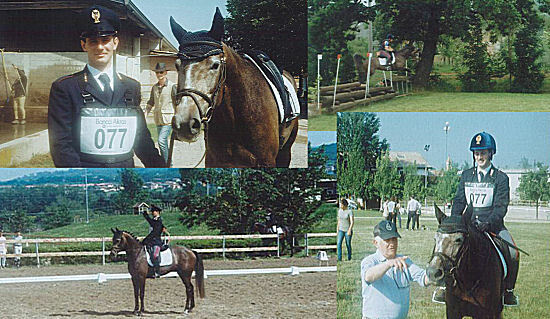 I highly recommend the German Horse Center to anyone searching for a sport horse in Germany." 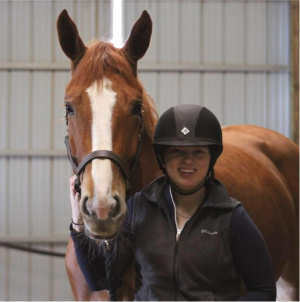 "I was provided with plenty of assistance and great service so that I could find the perfect horse for me. The whole operation run by German Horse Center really impressed me and I would use it again without hesitation." "… we are so happy that we found your site, which we came across purely by accident. It is really well organized and we could have no doubt saved at least a year of searching around ourselves. You can be sure that we will be recommending it to our friends." "In our search for the perfect horse, we had already given up hope of finding a service able to offer professional and qualified support for the process of seeking out possible candidates and making an initial selection. Then we found and made use of your service. As we ourselves are in the service industry, we feel well qualified to assess what you provide and are delighted to have found this all-inclusive service. The assistance we received in selecting our horse was excellent. Our priorities included the type of horse and the requirement that it should have received professional training well suited to its age; your service was so comprehensive that we could enjoy a calm and very successful 'shopping trip'. We wish you all the best for the future." Morten Wasmuth, Therese Alhaug and Malene Nilssen of the Norwegian equestrian magazine "Hesteliv". "We would like to thank you for the fantastic service you provided during the horse tour that you presented to us on 6-7 July. The horses we met were all very calm, confident and well trained, just as we were hoping for. It was also very impressive to see that your partners were great horsemen, with the horses’ wellbeing always in focus. We would like to wish you the best for your business in the future. Thank you also for your overwhelming service throughout the whole trip. The fact that everything was organized perfectly by you gave us the unique possibility to concentrate on the horses. All the best, Morten Wasmuth, Malene Nilssen and Therese Alhaug"
Gustavo is with Lucky one very successful in Florida. "Alfred and Lucky are doing great (the horses that were bought). (…) I think the personal guide service you provided was excellent. Very detailed and very organized. I think it's the best way to buy horses in Germany. Everything was very easy. The stables that you represent all have great quality horses. I had a very good time and I hope to be back soon."